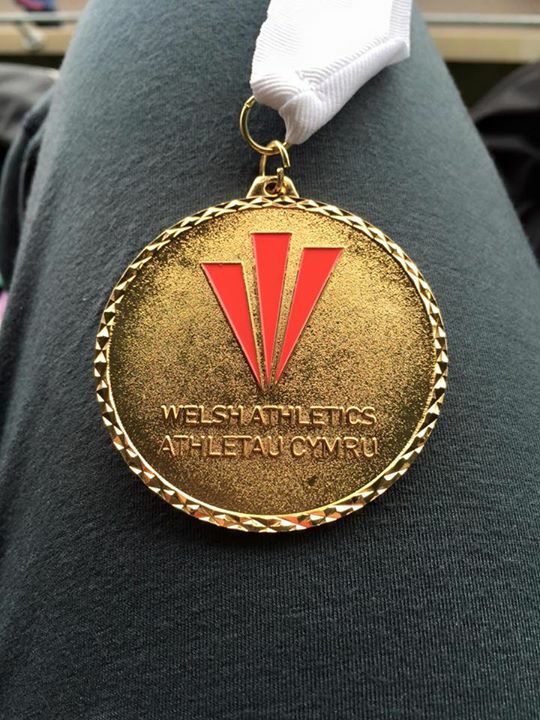 Congratulations to Holly Bradshaw and her return to competition at the weekend when she won the Senior Womens Pole Vault at the Welsh Senior T & F Championships in Cardiff. 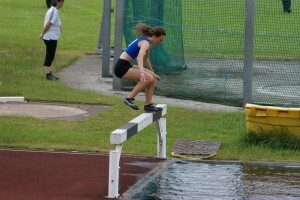 In the Competition she set an ALL COMERS RECORD and got the qualifying height for the World Championships being held in Beijing later this year. 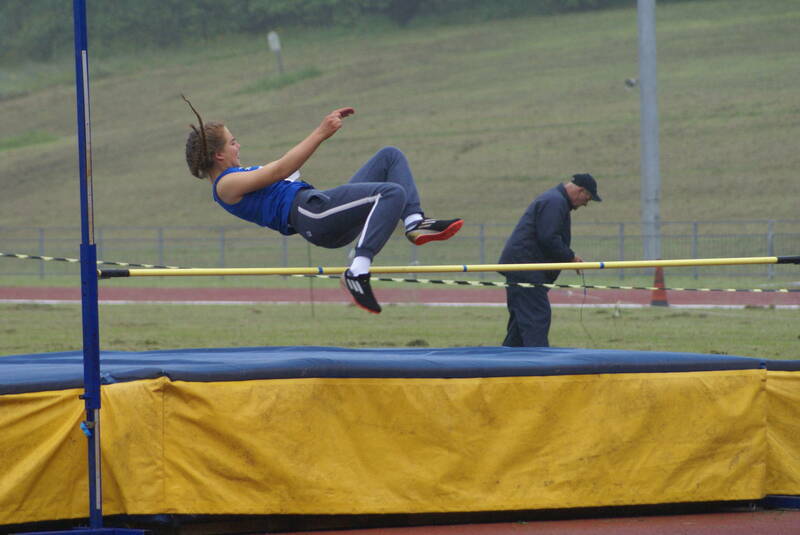 Holly commented afterwards that it was “The most amazing feeling competing today for the first time in sooo long. 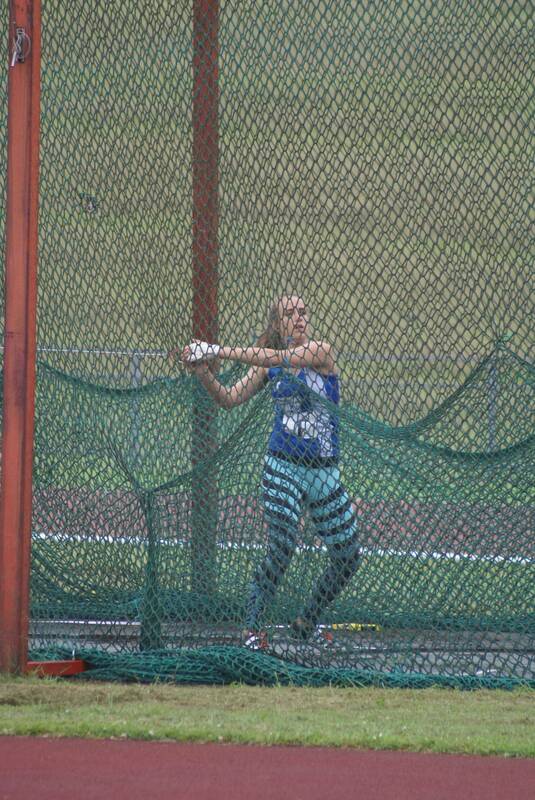 Nothing better then the feeling of doing something you love so much. 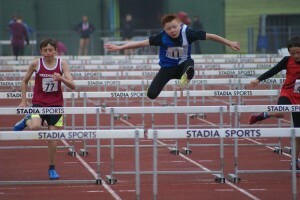 Win and solid 4.50 clearance. 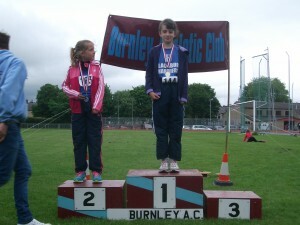 Very happy bunny. 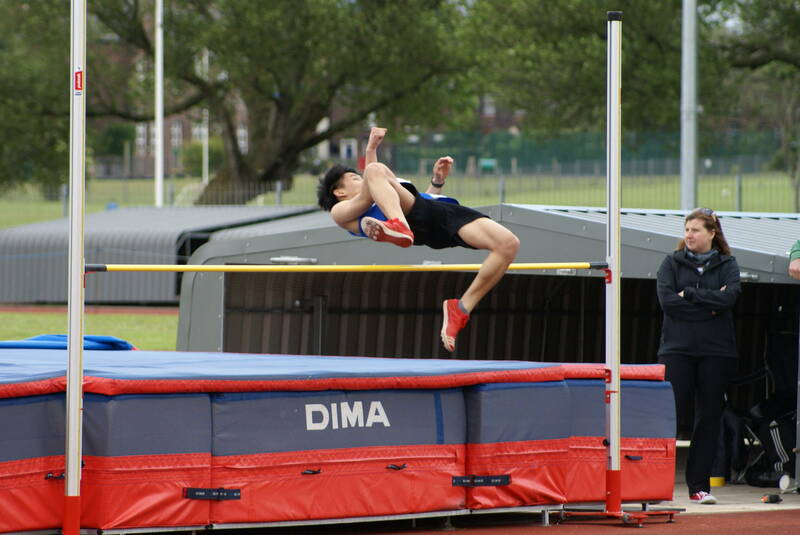 Joe Pearse was also in action at the Championships in the Senior Men’s High Jump where he finished in 4th place with a clearance of 1.95m. 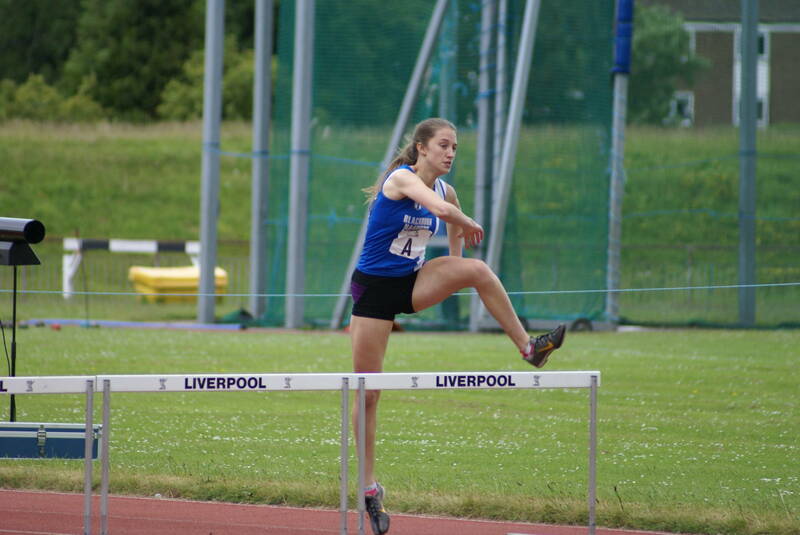 It was over to Wavertree on Sunday for Fixture Three of this years YDL Upper Age Group Division One League, which saw a sunny day and a good performance by the Harriers to finish second to Liverpool, leaving the Club in 3rd place as we approach the last fixture at the end of July. With a number of athletes missing on the day some of the Team went out of their comfort zone to do extra events. 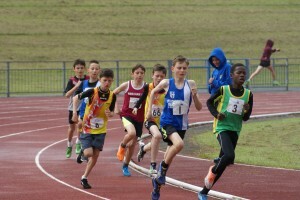 The Club had some new members out for the first time which helped achieve the overall result on the day and there were some good performances from them. 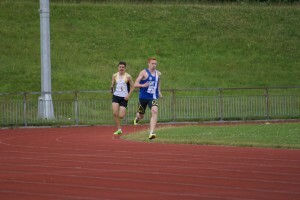 Eight of the athletes set new personal bests with U17 Connor Davison adding four metres to his in the Discus (31.23m) and taking 3rd place in the event. 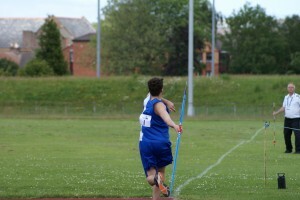 U17 Sam Pearson-Moore added nearly 10 metres to his his Javelin PB taking 5th spot with a new PB of 37.03m. 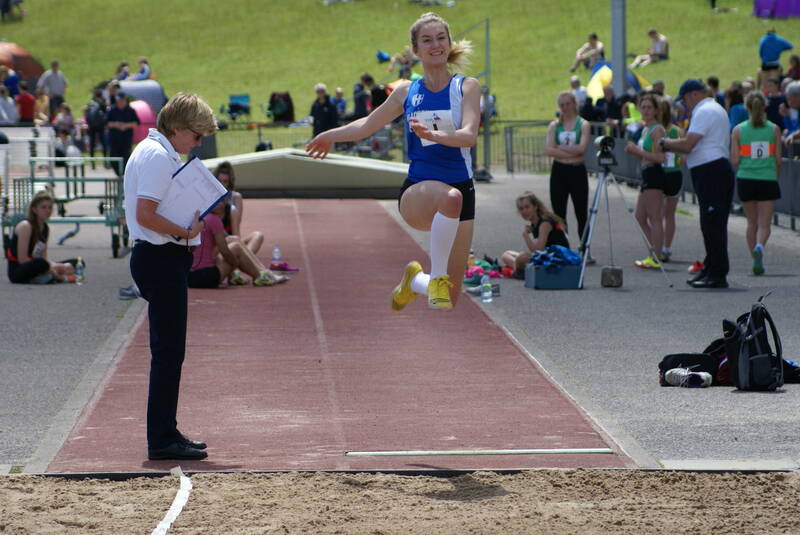 Lewis Old set a new PB in the Long Jump 4th with 5.15m and Libby Bonis (U17) took a tenth off her 200m time winning in 26.5. She was also given the same time as the winner (45.2) in the ‘B’ 300m with the width of a vest separating them on the line. 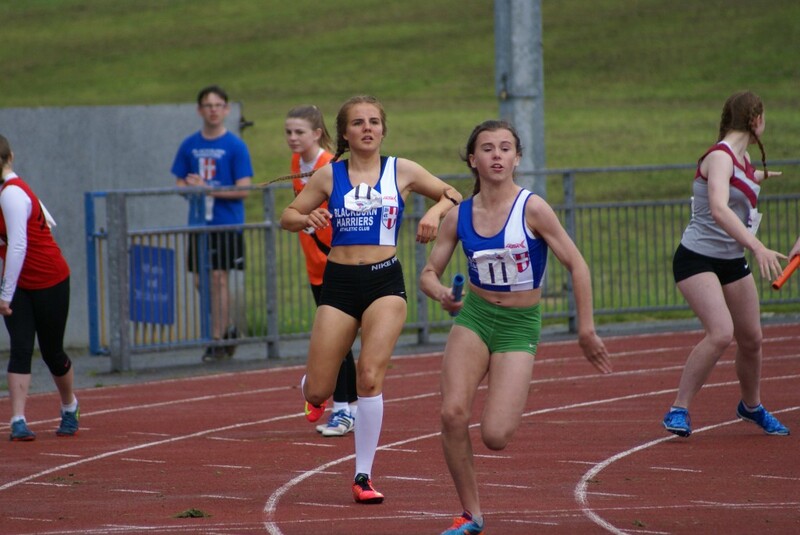 Olivia Wilson who is improving all the time cut over a second off her 300m time to set a new PB of 47.1 and Georgina Rickard (U17) added nearly a metre to her previous best with a leap of 4.30m. 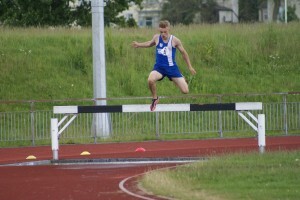 Byron Abbott knocked 8 seconds off his best time in the 1500m Steeplechase in 5.01.0. 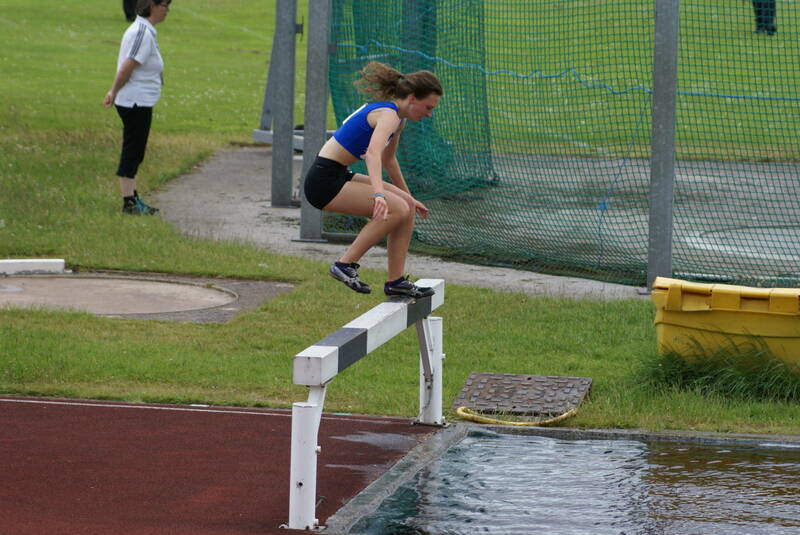 Liz Greenwood lopped over 14 seconds off her 1500m Steeplechase time when she won in 5.29.7 and this on her second only ever attempt at the event. 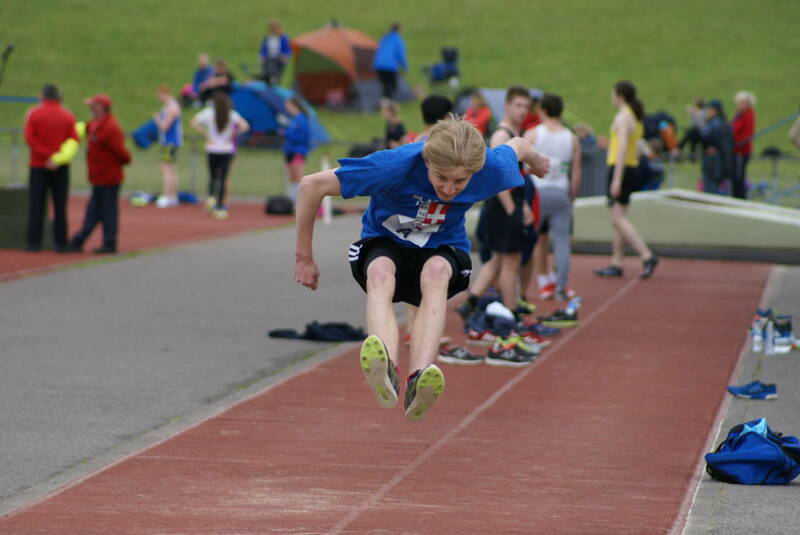 In addition to the new PB’s the athletes produced 14 individual event wins on the day including Connor Makin who ran solo in the 400m Hurdles – Ben Aspinall with a double win in the U20 Long Jump (6.28m) and Triple Jump (13.56m) – U20 Caleb Lee in the Triple Jump 10.20m – U17 Byron Abbott in the 1500m Steeplechase (5.01.0) – Jacob Roberts took the U17 Hammer with a throw of 47.95m – Connor Davison won the Shot Putt (u17) with 10.73m in addition to his big PB in the Discus – Phoebe Howe had a double win in the U20 400m Hurdles (77.8) and 1500m Steeplechase (6.22.4) – Katie Buckingham won the 1500m Steeplechase in 5.53.4 and there is no doubt that the efforts of the athletes who competed in the Steeplechase on the day brought a large number of points to the Team – Rebecca Orrell won the U20 Hammer with a throw of 38.59 – Grace Handley had a double win in the U17 1500m (4.53.5) and the ‘B’ 3000m in 11.32.5 as did Liz Greenwood who took the U17 ‘A’ 3000m in 10.36.2 and the 1500m Steeplechase in 5.29.7 – Megan Clarkson made a winning return to competition after quite a long lay off due to injury, winning the U17 ‘B’ 1500m in 5.25.2 and then ran a solid 2.45.1 in the ‘B’ 800m. 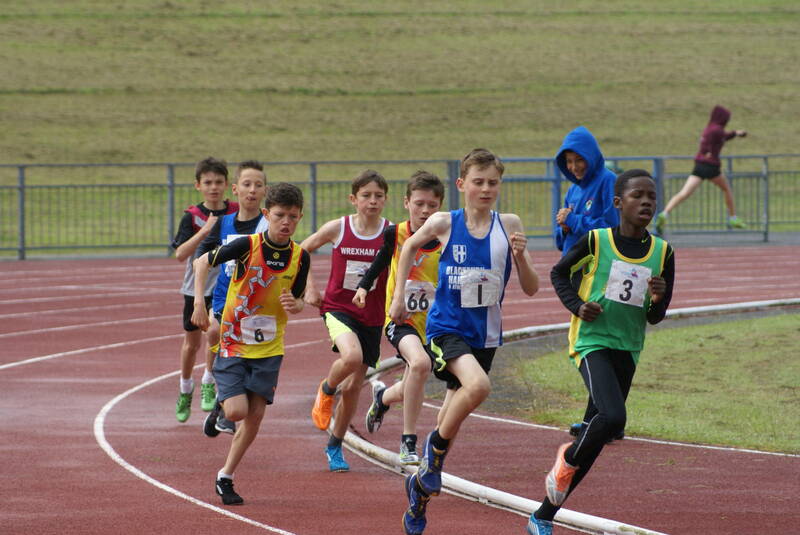 Great contributions by all the athletes on the day ensured that the points kept rolling in. 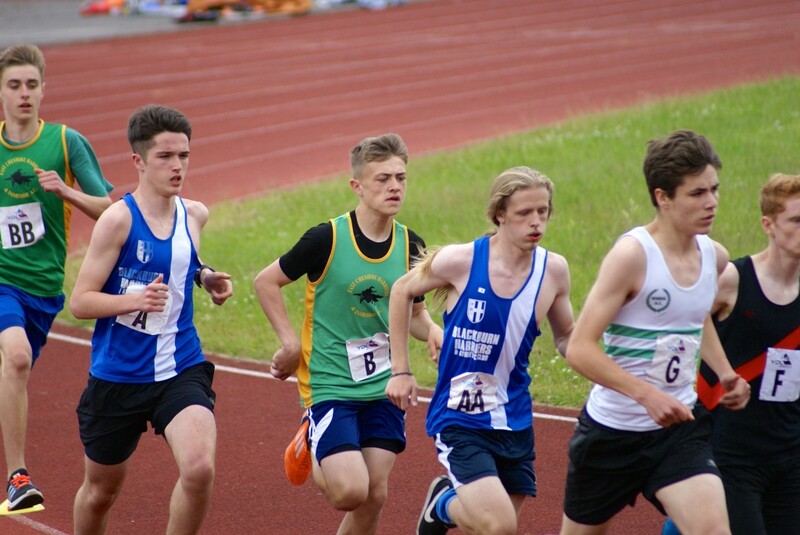 In the U20 Age Category Jake Almond who hasn’t competed of late and new member John Iluga contested the sprints with Jake taking 4th in the 100m (12.4), 4th in the 200m (24.2) and John 4th in the 100m ‘B’ (14.1) and 3rd in the ‘B’ 200m (28.7). 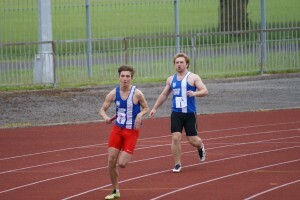 Connor Makin after his solo run in the 400m Hurdles ran 53.3 in the 400m (3rd) and Gareth Johnson 3rd in the ‘B’ ran 63.9. 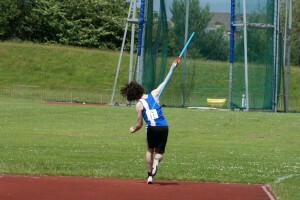 Connor then threw in the Javelin (5th) with 23.00m and the Hammer where he took invaluable points coming 2nd in the ‘B’. 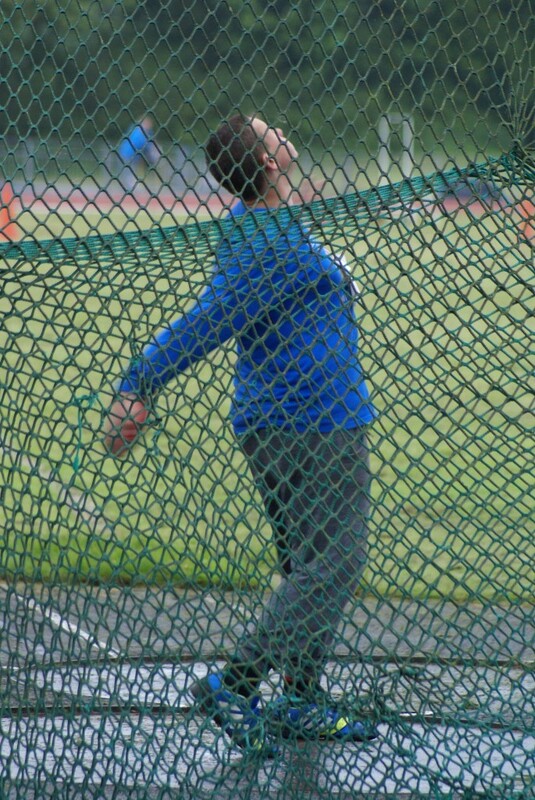 Gareth also helped out on the Throws with a 2nd in the ‘B’ Discus (16.80m), 6th in the ‘A’ Shot Putt (7.69m) and a 4th place in the ‘A’ Hammer (19.20m). 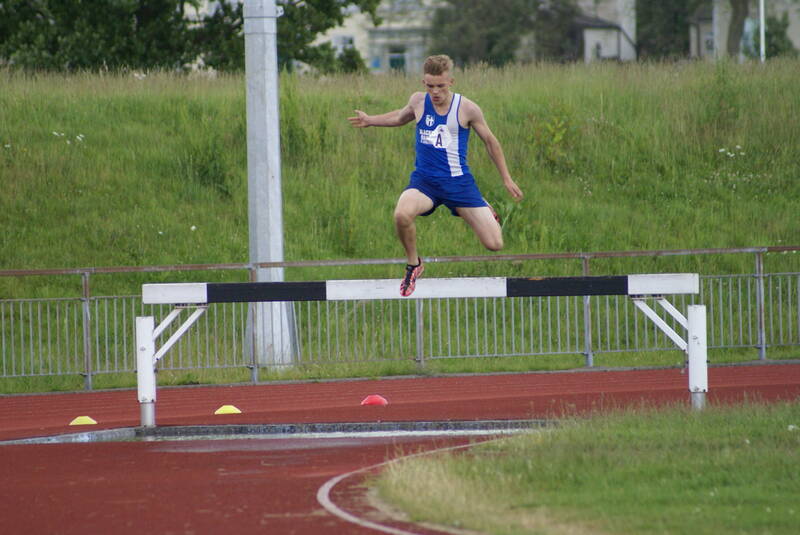 Chris Richardson-Dulling put a shift in with 4th in the ‘A’ 1500m (5.14.8), 4th in the ‘A’ 3000m (11.52.1) and 2nd in the 2000m Steeplechase (8.26.7). New member Jamie Tebay in his first competition started really well placing 2nd in the U17 Javelin with a throw of 22.28m and ran ran 14.3 in the 100m ‘A’ with Lewis Old running faster in the ‘B’ clocking 13.4. 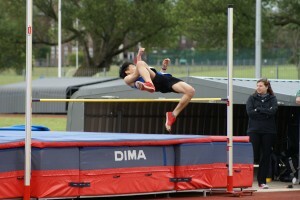 Caleb Lee added a 2nd placed 5.32m Long Jump in the ‘B’ U20’s as well as a 1.45m High Jump (5th). 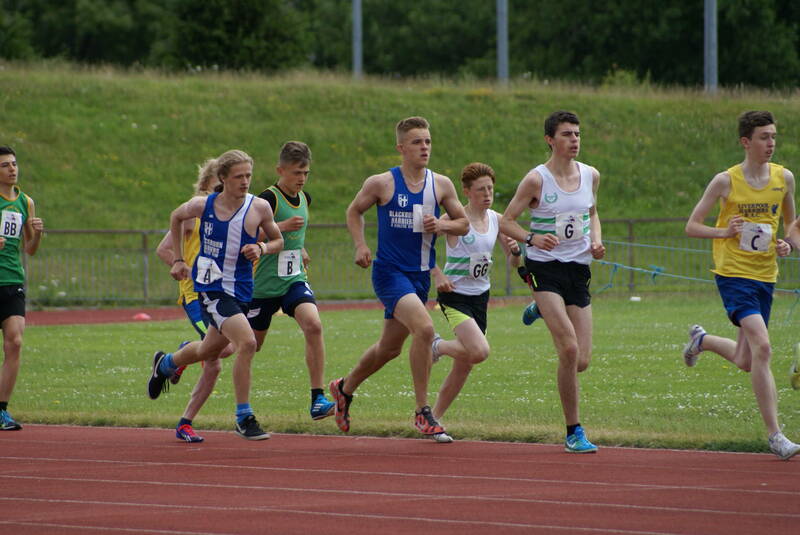 Another new member – Zac Hargreaves (U17) – got stuck in and did well running 2.17.2 in the 800m ‘A’ with Tom Mckee taking second spot in the ‘B’ with 2.14.7. 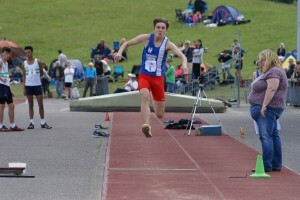 Zac also had a good competition in the U17 Triple Jump finishing 2nd with 11.83m and just 6 cms off the winner. 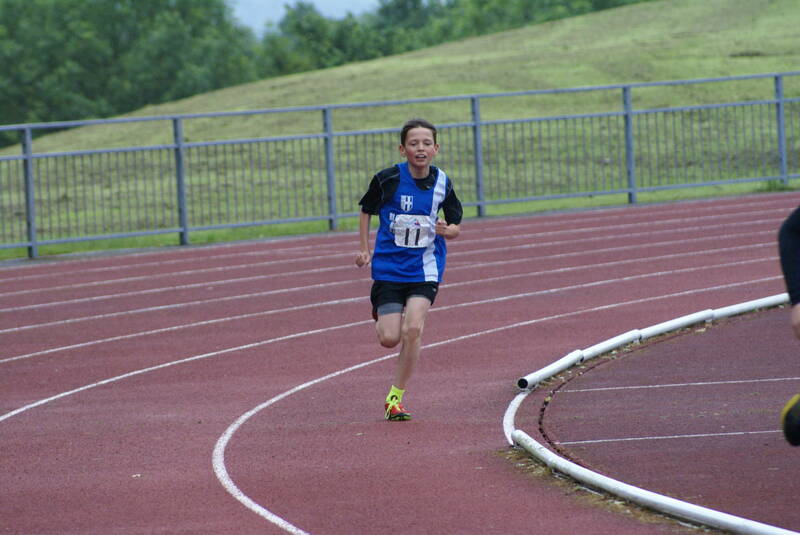 Tom then went onto the 3000m running solidly in 2nd place for a time of 10.23.7. 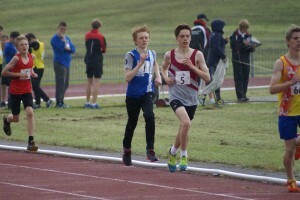 Zac took on the 1500m too taking 2nd in 4.37.0 (‘B’ Race) and Byron Abbott finished 4th in the ‘A’ in 4.31.4. 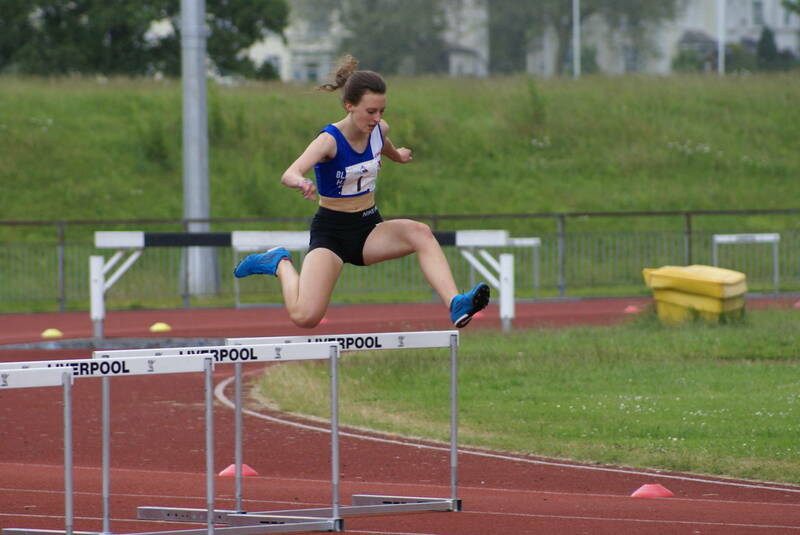 As well as her effort in the Steeplechase, Katie Buckingham placed 3rd in the 100m Hurdles (18.0) and 2nd in the 400m Hurdles (68.6). 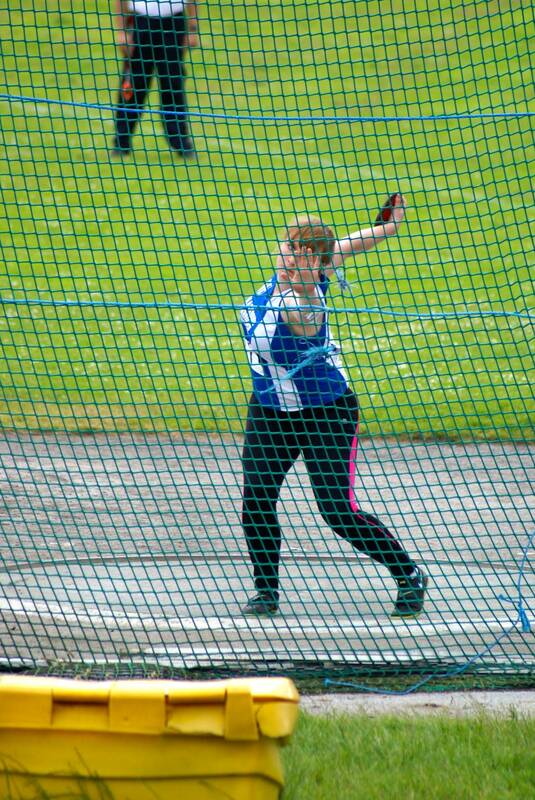 Rebecca Orrell finished 5th in the ‘A’ U20 Discus with 24.97m and Grace Handley was absolutely delighted to get a big PB in the U17 Discus with a 3rd placed throw of 12.76m. 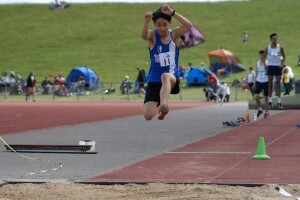 Jane Saothong who took 3rd place in the U20 ‘B’ Long Jump, took a good 3rd place in the Hammer and 2nd in the Shot Putt. 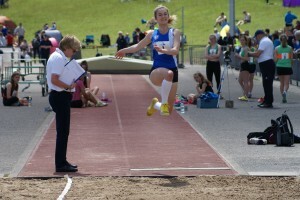 Olivia Brooks came 2nd in the ‘A’ U20 High Jump with 1.45m and 2nd in the Long Jump ‘A’ with 4.75m. 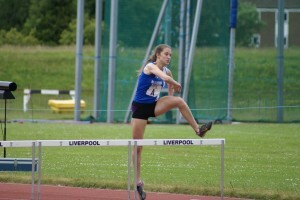 Esme Pearse finished 4th in the 80m Hurdles (14.6) as well as 3rd place in the 300m Hurdles (56.2). 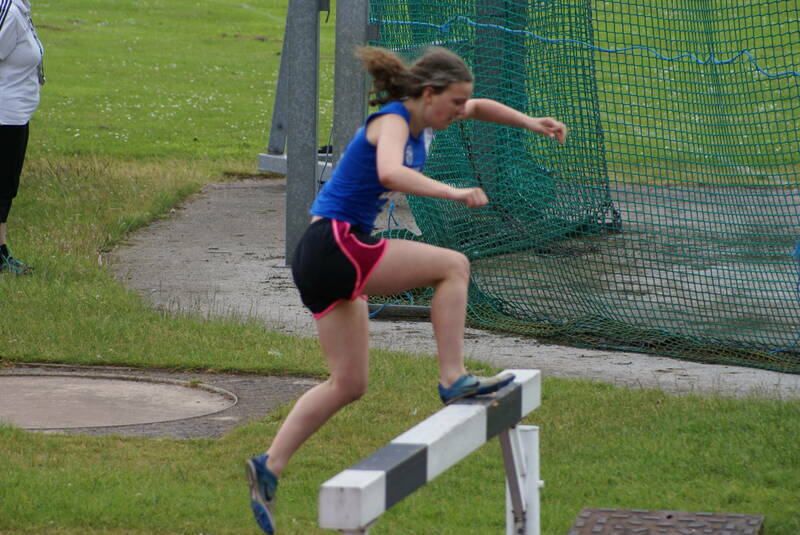 Another new member, this time in the girls – Hannah Kelly – in her first ever competition came in 5th in the U17 Shot Putt (6.87m). 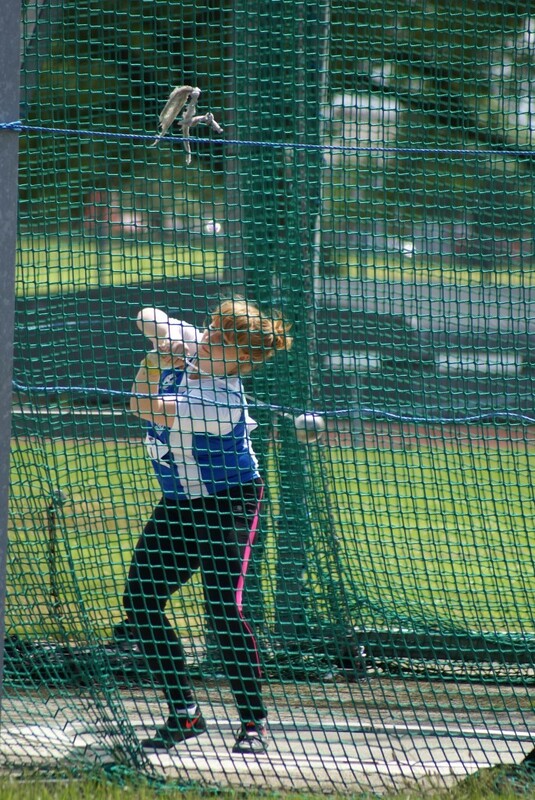 E-trade means around the globe push in direction of eco friendly output, swap, and monetary incorporation. 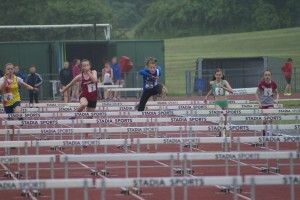 It has noticed enterprises in almost any regions give up nationalistic views from larger perspectives. 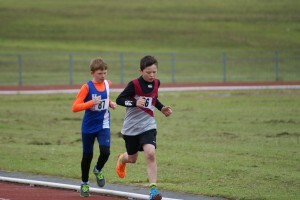 E-business helps to ensure that providers take into account the requires of not just their speedy small business climate but the callings with the much wider universal realms.research papers for sale It entails firms to generally be considerably more interlocked and dependable of their surgical procedures. 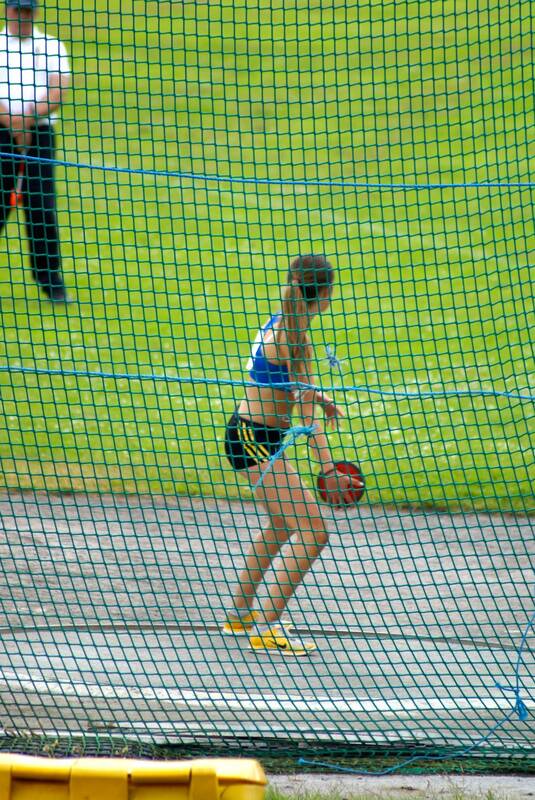 It makes it much simpler to exchange goods and services all over the world without any several regards to federal limits and various standard boundaries .The creation of e-trade has ascertained that countryside and national borders not any longer get precedence, that is why aiding interaction, supply of expert services and high quality development in your production trade. 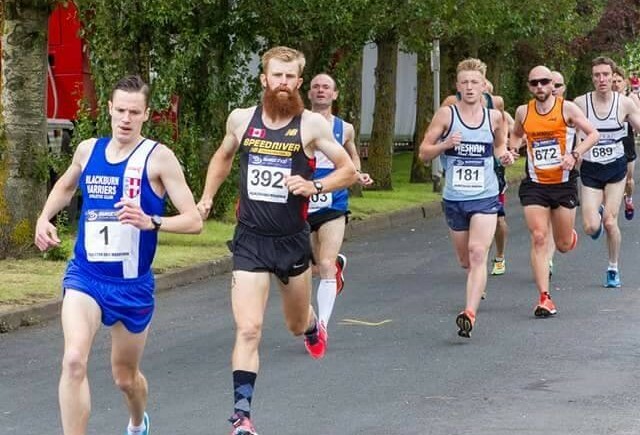 Six hundred and one runners turned up at this years Freckleton Half-Marathon in cooler weather than is usual for this particular event. 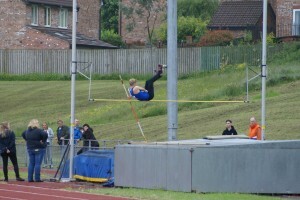 There was nothing very ‘usual’ about the outcome though. 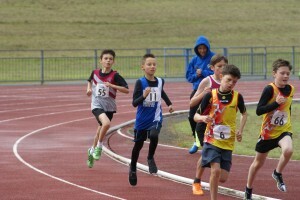 Blackburn Harrier Ben Fish won for the ninth consecutive year in a time of 69.19, nearly half a minute in front of the 2nd placed finish John Mason. 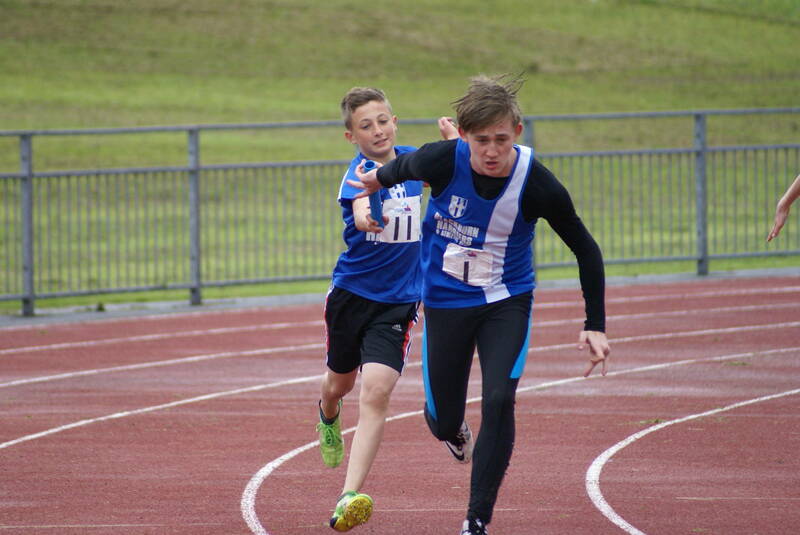 Its an incredible feat to have won this race nine years in a row and who would bet that Ben won’t target a straight ten next year. 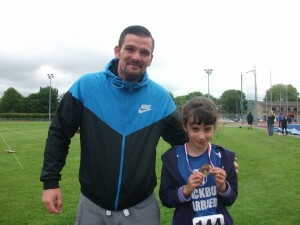 After the Race he told us that the “Race went well, windy, but cool unlike last year which was boiling! John Mason chased me all the way. 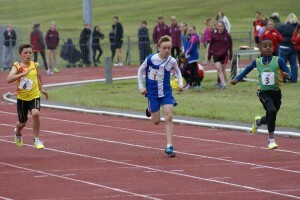 Won by 20 secs for 9th win”. 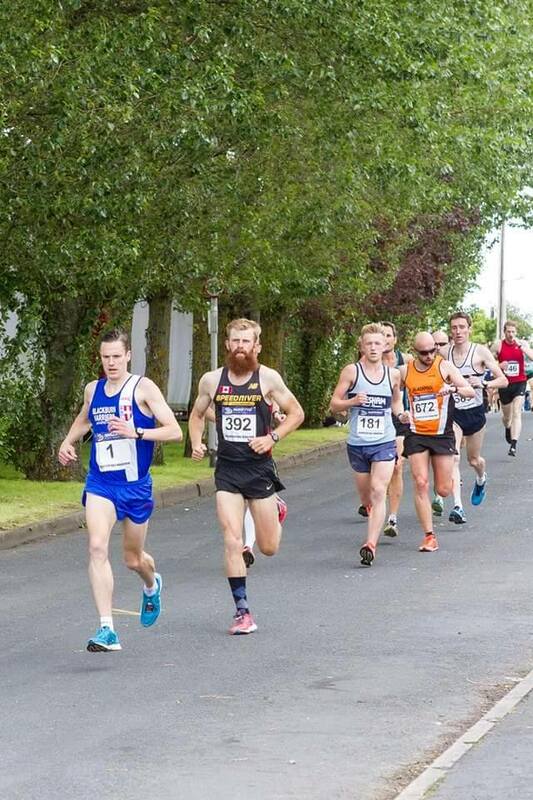 Three other Harriers also ran the Race – V40 Allan Hartley coming in 105th in a time of 1.36.28 – V40 John Cookson in his debut Half-Marathon was 138th (1.39.20 and Dave Morris (492nd) also running this distance for the first time in 2hrs.15.08. 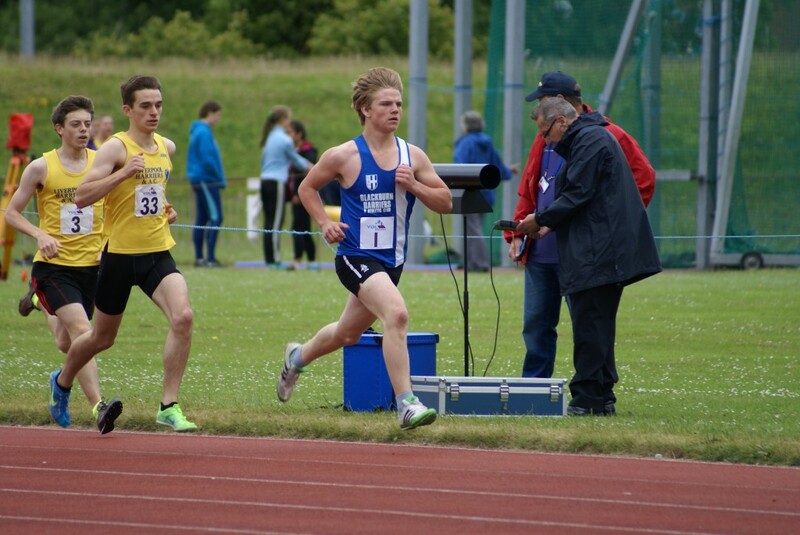 The latest Race in the Podium 5k Series took place last Saturday night – June 20th – and saw another win for Chris Livesey in 15.04. 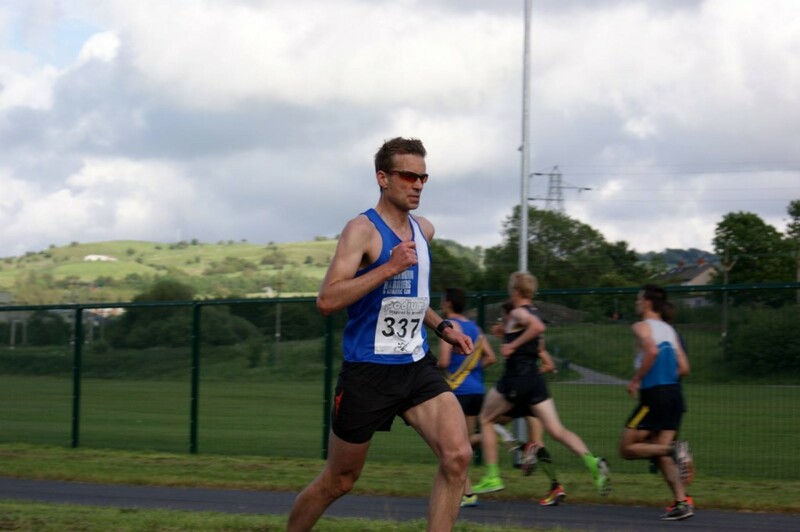 Blackburn Harriers Tim Raynes and Andy Buttery ran in the ‘A’ Race featuring 28 athletes with Tim clocking 16.08 in 11th place and Andy 16.43 in 20th. 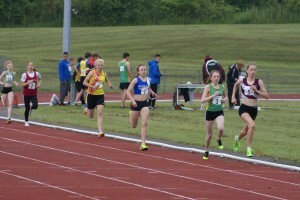 Laura Hesketh who runs on the Track for Blackburn Harriers ran in the ‘B’ Race placed 7th in 19.14. 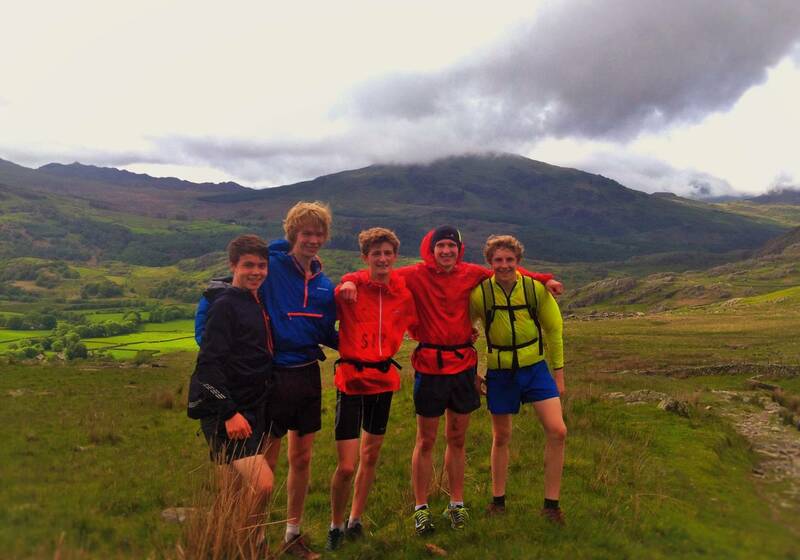 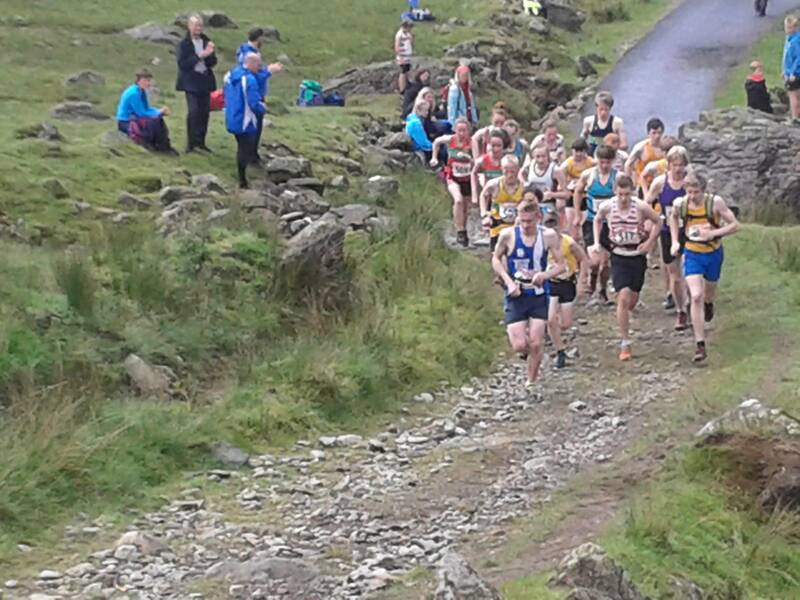 Jack Hindle and Josh Boyle ran really well at the Turner Up-Hill Race at the weekend with Jack winning the U18 Boys Race and Josh coming 2nd in the U16 Race. Jack won his Race in 20.41, nearly half a minute in front of 2nd placed Chris Law from Holmfirth. 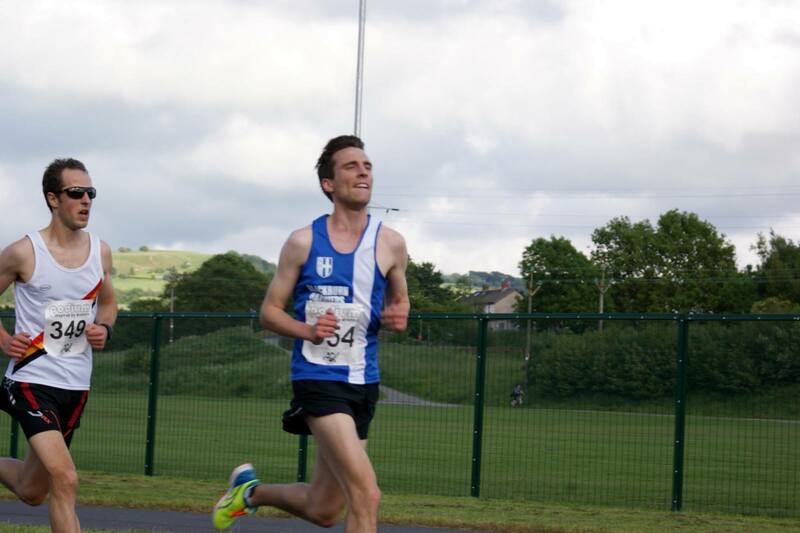 He was delighted with his win and told the Club that he was “Really happy to get a win, my form is starting to come in now at the right time. 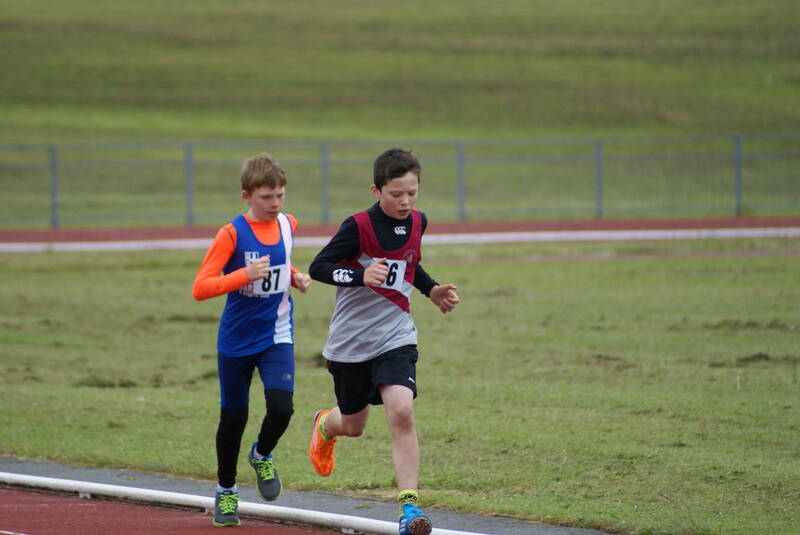 It was a tough ascent to the summit finish but felt strong, happy to know that the hill training is paying off.” Josh was in a very competitive race with less than 30 seconds separating the first four. 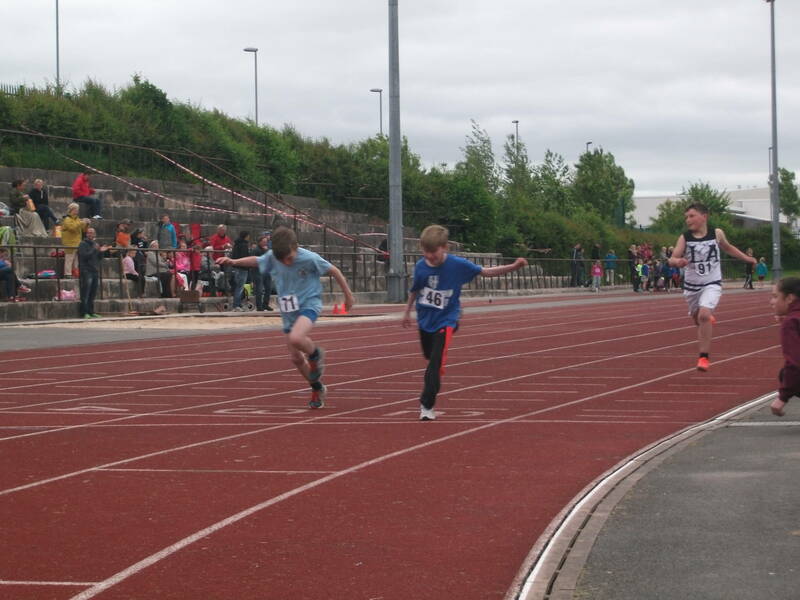 Josh came 2nd in the end in 16.33 just four seconds in front of 3rd. This local favourite Race – Aggies Staircase – attracted 115 runners last Thursday evening and was won by Ben Coop from Bury in 30.06. 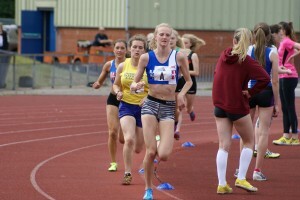 Liz Greenwood had a very good Race finishing 7th overall in a time of 33.26 and was also the 1st female runner home. Liz was followed by Danny Maynard in 53rd (38.22) – John Cookson (65th) in 39.53 – Danny Teare (74th) in 41.25 and Ben Armstrong (87th) in a time of 42.47. 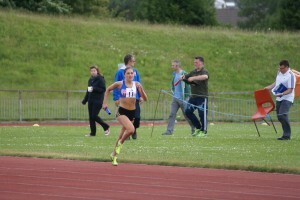 V50 Jan Buckingham is chasing her 10k’s and ran the Pilling 10k on June 20th finishing 28th in 50.16. 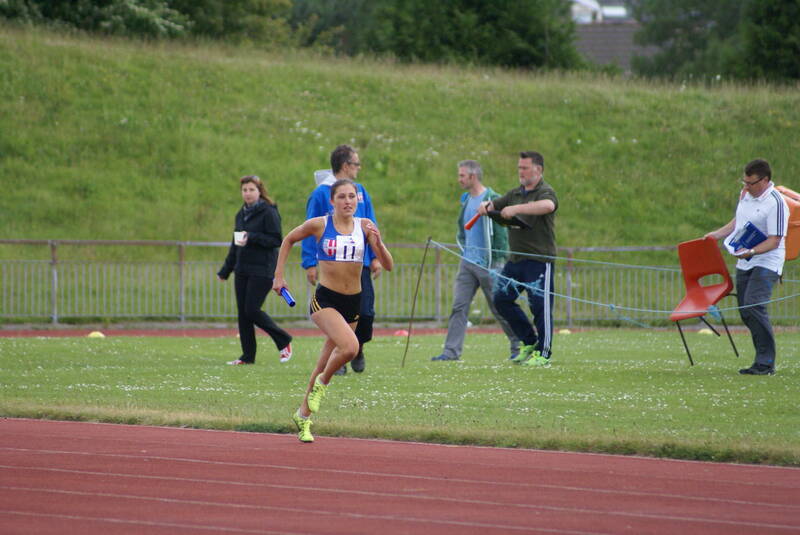 She was 2nd V50 in the Race, the fifth time that she has achieved that since September which is really consistent. 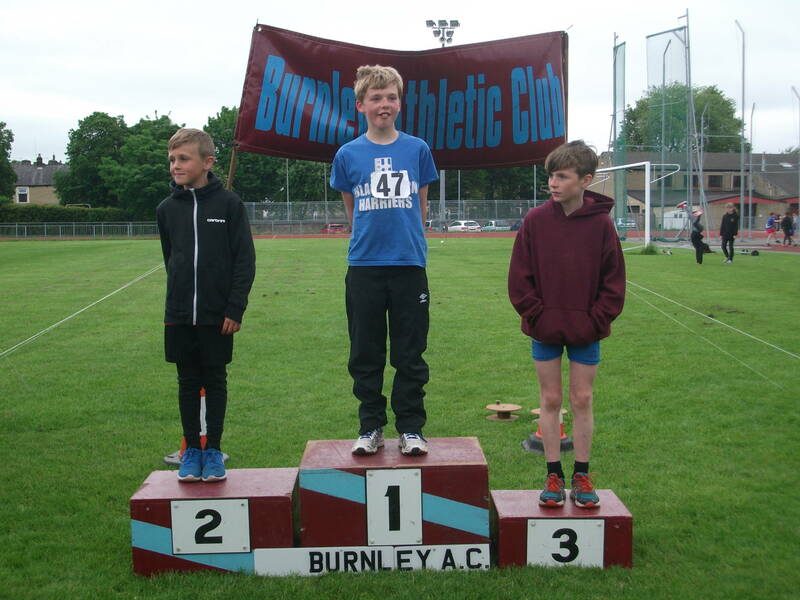 A chance for Sportshall Athletes aged 8, 9 and 10yrs to compete was provided at the Burnley Open Medal Meeting last Sunday – June 21st – and 14 young Harriers took the opportunity. 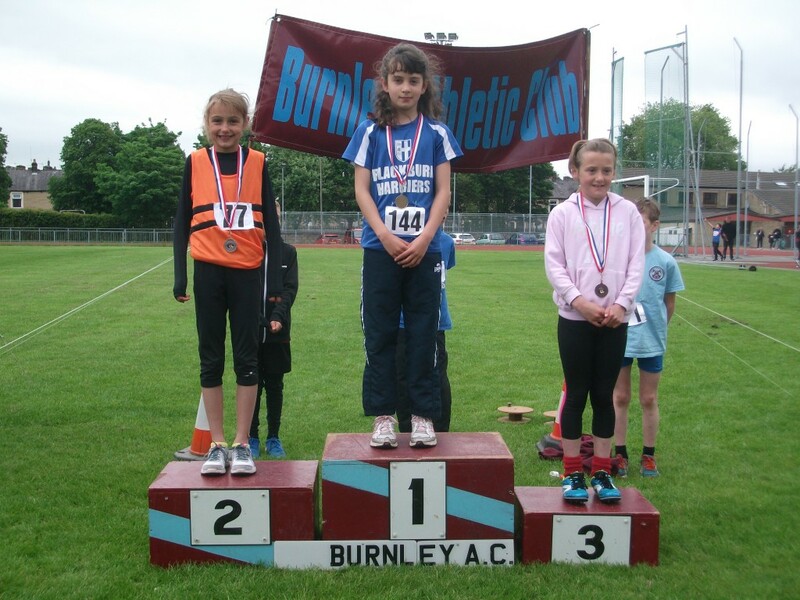 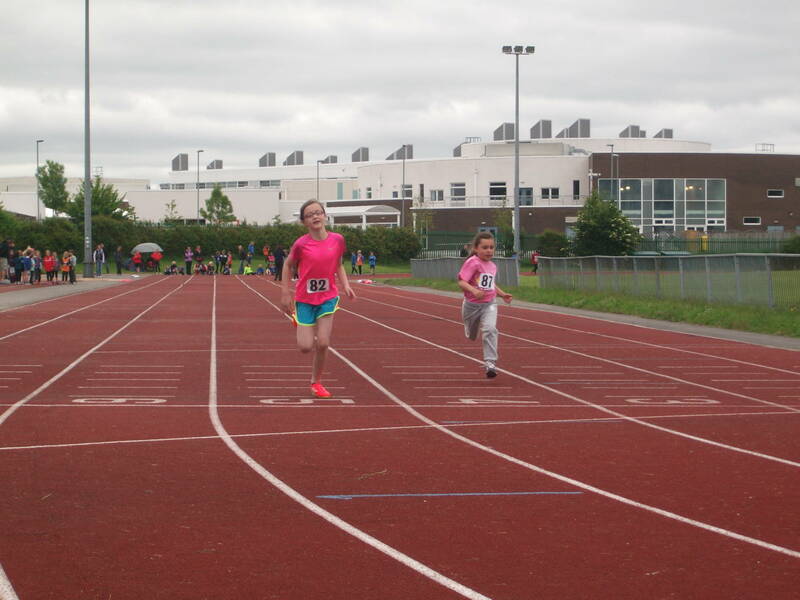 Just one Harrier in the U9’s – Rimini Bellusci – who took on the Long Jump, 50 metres and 150 metres finishing 3rd in the 150m in a time of 27.90 – 7th in the 50m (9.50sec) and 8th in the Long Jump with 2.18m which was a really good effort. 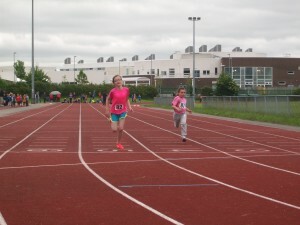 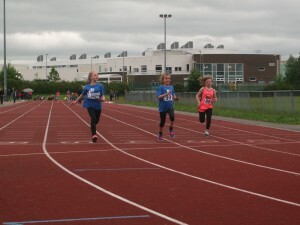 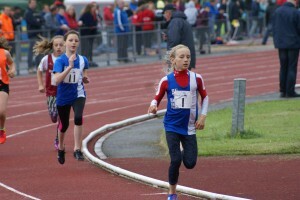 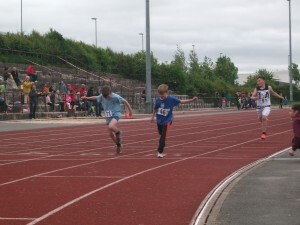 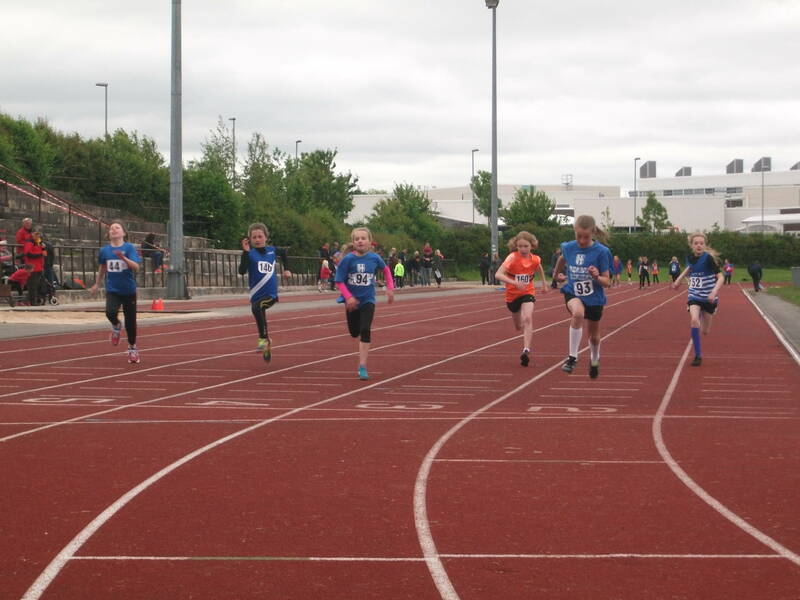 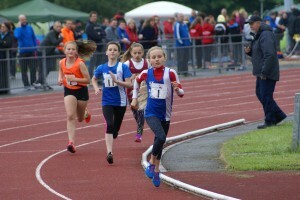 In the U10’s the Club had seven athletes competing in quite a number of events. 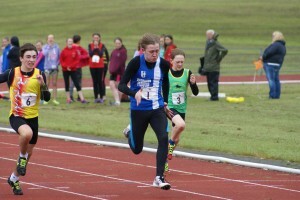 Kate Cookson won the 600metres with a time of 2.10.7, took 8th place in the Long Jump with 2.63m and won the Shot Putt with 3.69m. Another winner for the Harriers was Issac Butler taking the 600m in 1.59.6, came 2nd in the Long Jump with 3.05m and 9th in the Cricket Ball with a throw of 19.26m. 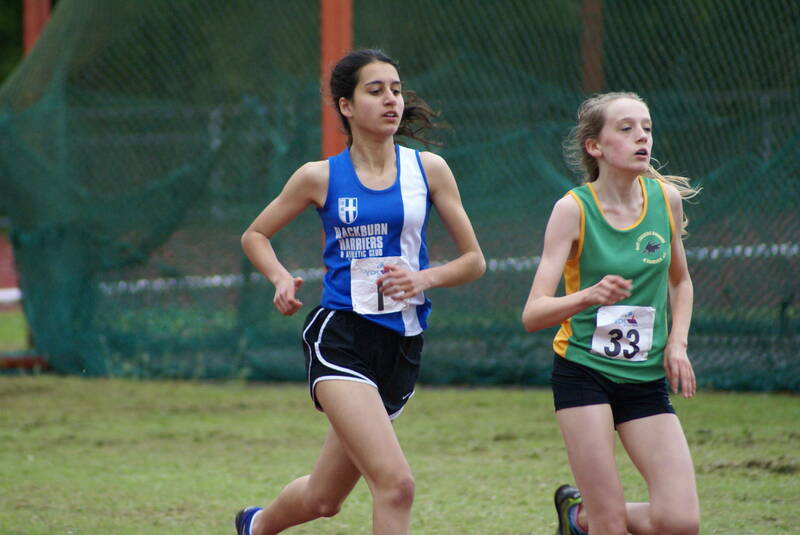 Natasha Hill took 8th place in the 600m (2.22.0) and one place behind came Jadyn Armstrong with 2.28.1. These two girls reversed positions in the 75m with Jadyn finishing 6th (13.30) and Natasha 7th (13.90). 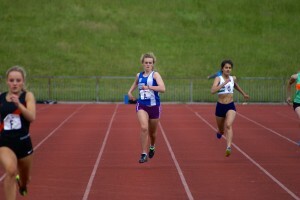 Grace Targett ran 14.10 in 9th place. 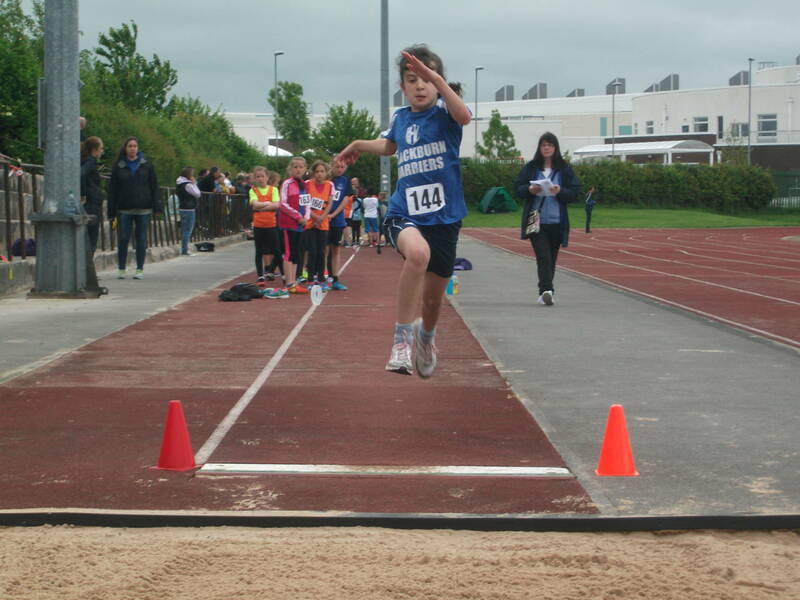 In the Long Jump Natasha was 10th with a jump of 2.49m, Jadyn came 11th (2.40m) and Grace 13th (2.24m). 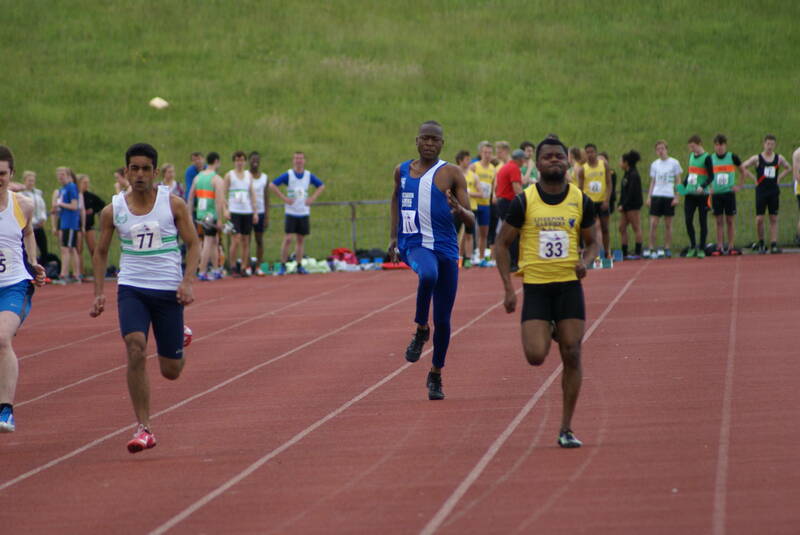 In the 600m Samual King ran 2.26.5 ,jumped 2.38m in the Long Jump and threw the Cricket Ball 21.0m in 7th spot. 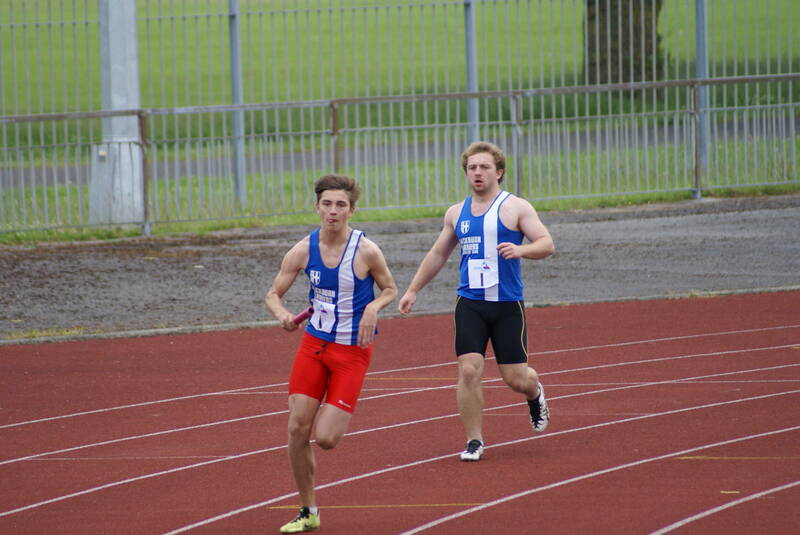 Oliver Proctor was the sole Harrier in the 75m placing 8th with 13.40sec. Oliver then jumped 2.71m in the Long Jump (6th out of the 15 entered). 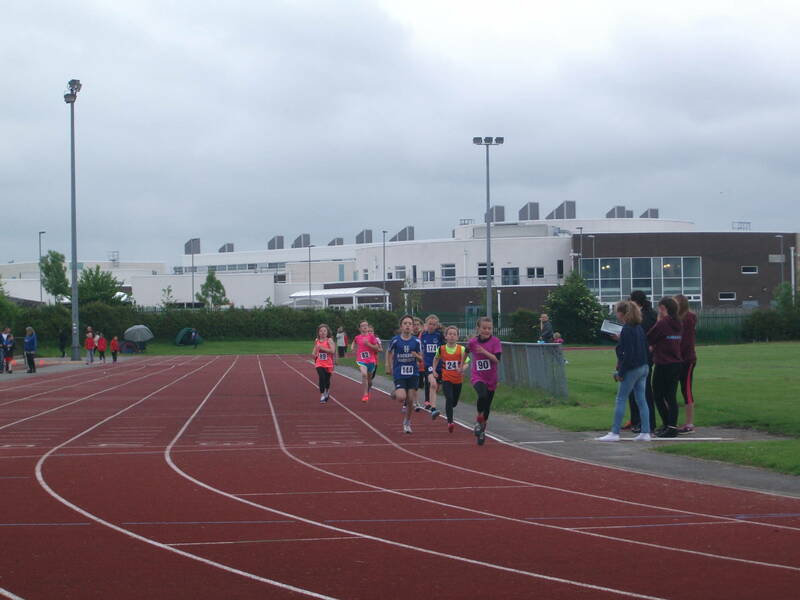 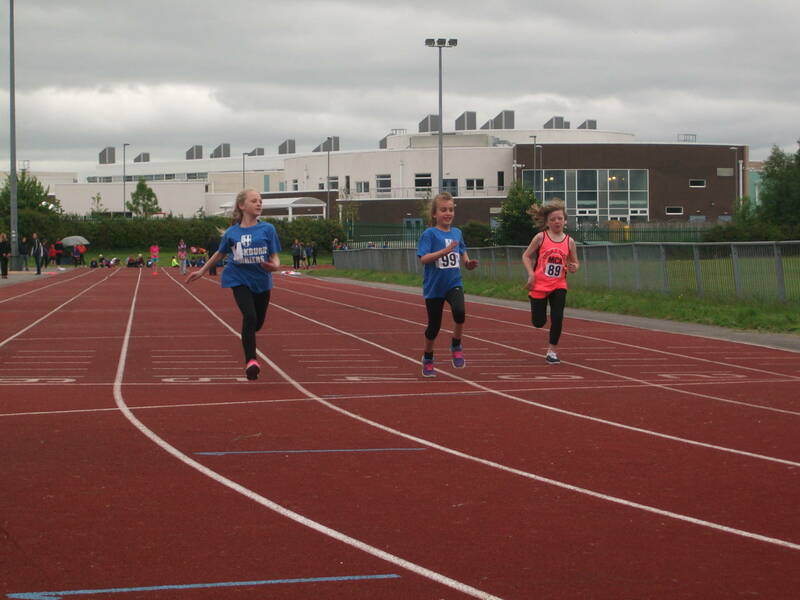 Leah Hoole took 3rd spot in the U11’s 600m which featured 16 runners in a time of 2.04.4, a new PB by 10 seconds with Molly Nicholls in 8th (2.15.1) and Danielle Probert (13th) in 2.22.5 – a new PB. 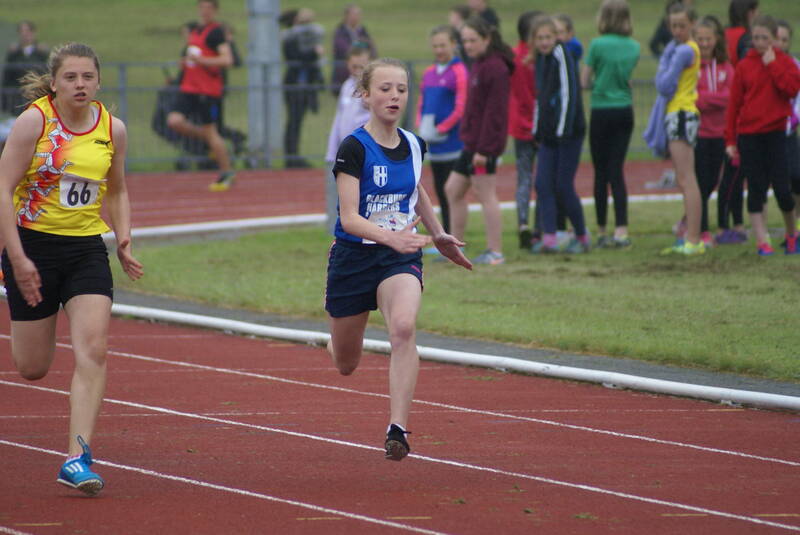 Alice Townson was one of 22 runners in the 75m and finished in 5th with a time of 12.5sec, a new PB by four tenths of a second, followed by Leah Hoole (11th) in 12.9sec, Molly Nicholls in 15th (13.2sec), Sian Coverley 20th (15.1sec) and Caterina Lombard (22nd) in 15.9sec. 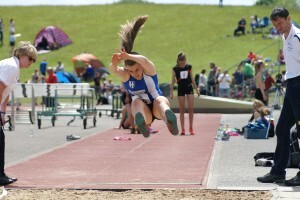 In the Long Jump Leah Hoole set another PB finishing 4th out of the 17 athletes competing with 3.20, over half a metre better than her previous best. 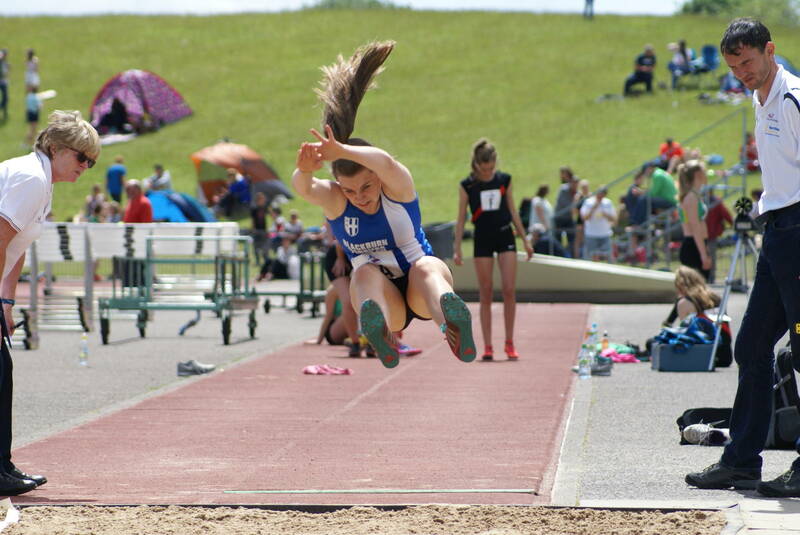 Another new PB was landed by Alice Townson in the Long Jump and again by over half a metre when she finished 5th, one place behind Leah with 3.15m. 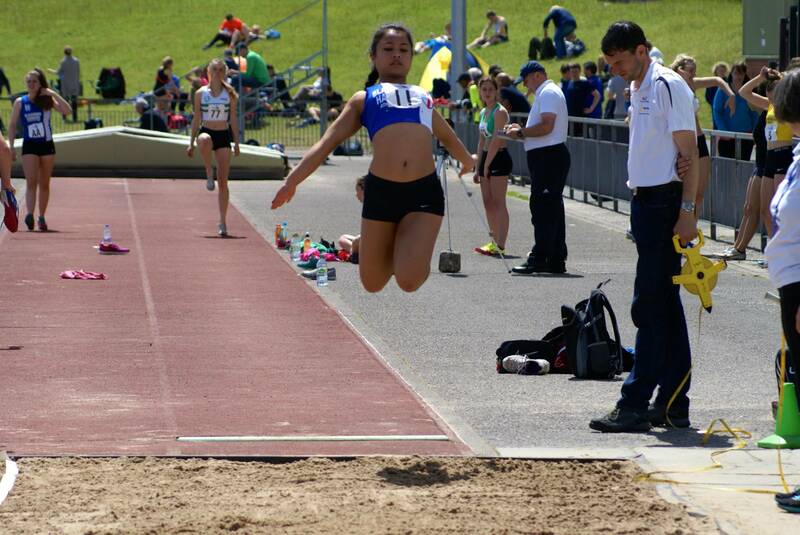 Three other youngsters competed in the Long Jump with Danielle Probert placing 15th (2.37m) – Caterina Lombard (16th) with 2.29m and Sian Coverley 17th (2.16m). There was a win for Danielle Probert in the Cricket Ball with a throw of 25.93m, Caterina Lombard finishing 5th (16.80m), Molly Nicholls in 9th (12.65m) and Sian Coverely 10th (10.66m). 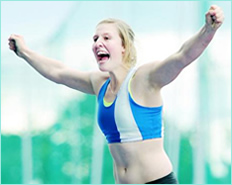 A win also for Alice Townson in the Shot Putt with a throw of 4.55m – the Meeting record was set in 2003 at 5.14m so not beyond reach. Another cracking performance by the Harriers in the YDL – Lower Age Group Division West 2 – fixture at Macclesfield on Saturday saw them cement their 2nd placed position in the League and with every expectation of promotion to Division One in 2016. 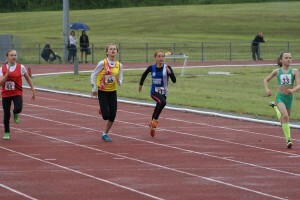 Between them, the Team registered 18 event wins, 12 second places, 12 third places and a massive 26 new personal bests. 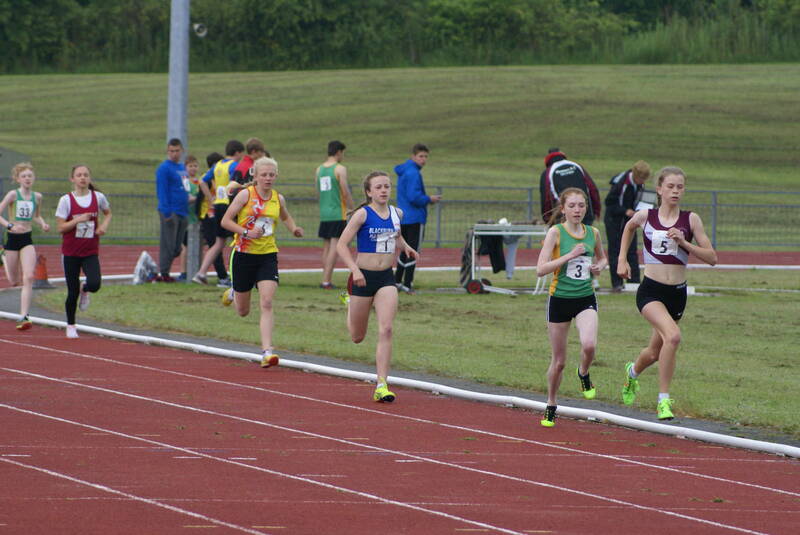 Amongst them were some great PB’s for middle distance athletes. 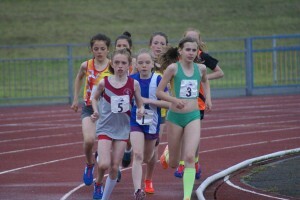 Hannah Cookson knocked a huge 29 seconds off her PB in the 1500m winning in a tremendously well judged race in 5.08.3 against the Macclesfield athlete. 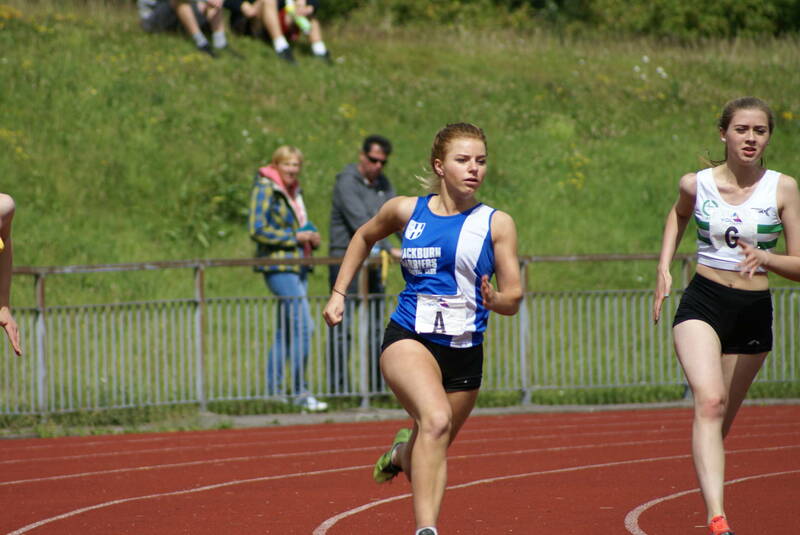 She also set another PB when she won the 200m in 27.9. 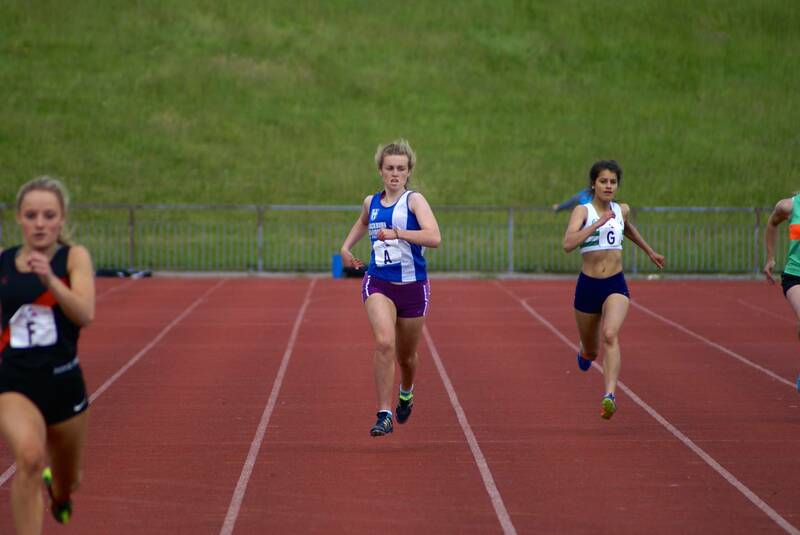 Maddie Elliott cut over 8 seconds off her 800m time for a new PB of 2.26.2 in 3rd place. 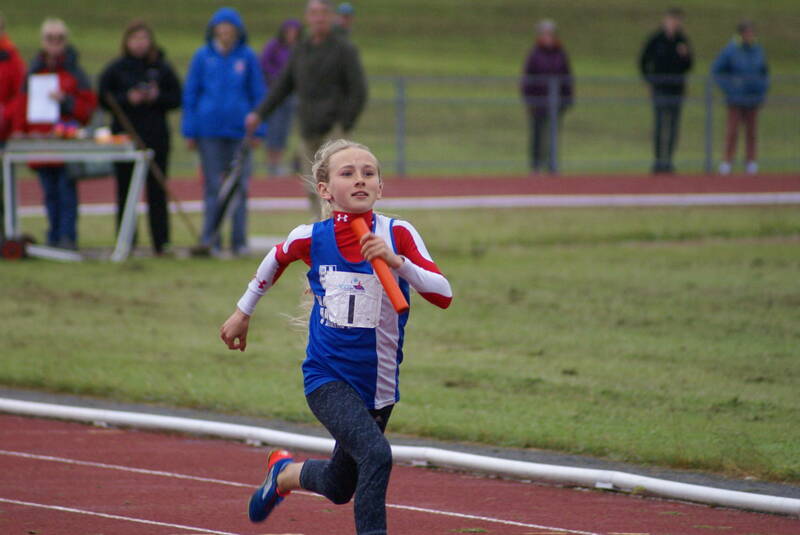 Before that she won the Pole Vault at her first ever attempt getting over 1.70m and then set another PB in the 75m Hurdles winning the ‘B’ Race in 14.6. Amy Davies was the next one to set a new PB in the middle distance events placing 3rd in the 1200m in a time of 4.08.1 over two seconds better than her previous best. 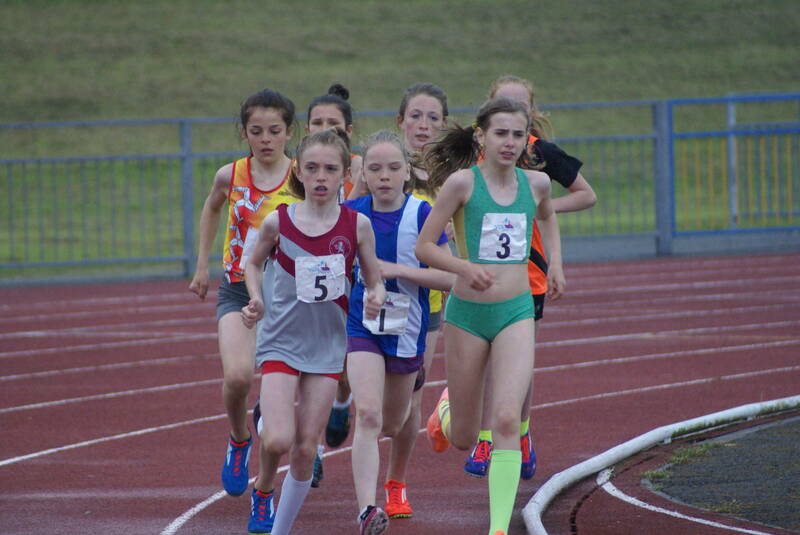 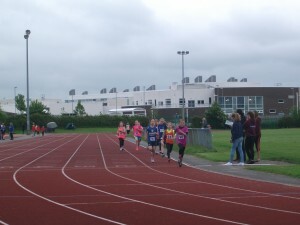 New member Jess Watson took a 4th place in the U13 800m with 2.53.7. 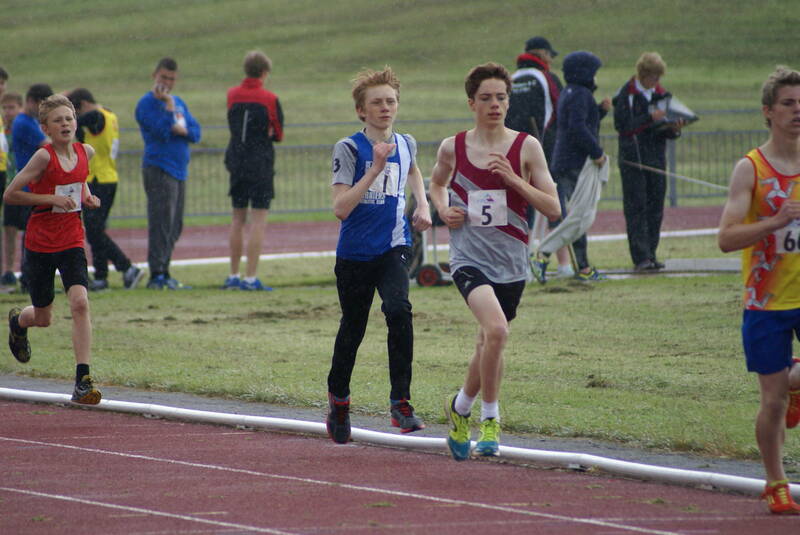 Jamie Teare finished 3rd in the U13 1500m ‘A’ Race setting a new personal best by over 10 seconds in 4.55.7. 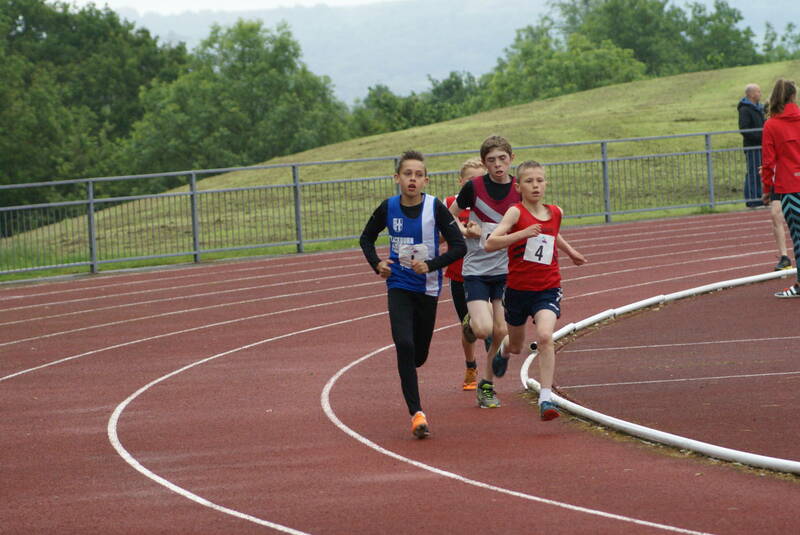 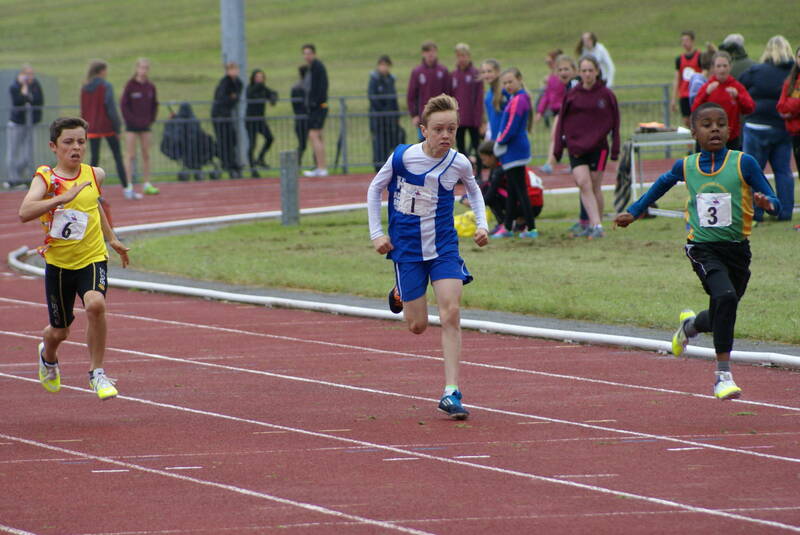 Another U13 setting a new PB was Daniel Brown reducing his time by 7 seconds in finishing 3rd (2.40.3) in the 800m. 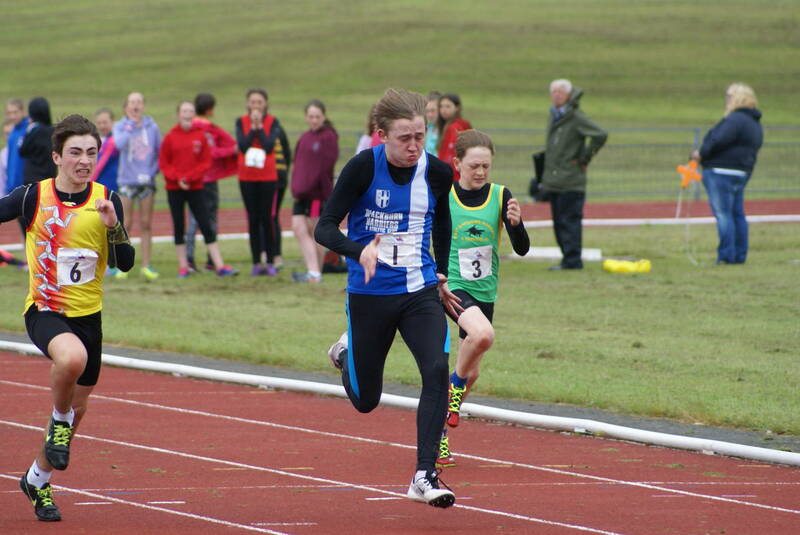 Bottom of age Eleesha Charnley cut three seconds off her time for a new PB of 2.52.1 in the 800m and then brother Rhys Charnley followed suit with a new PB of his own by six seconds in the 800m (2.30.5). 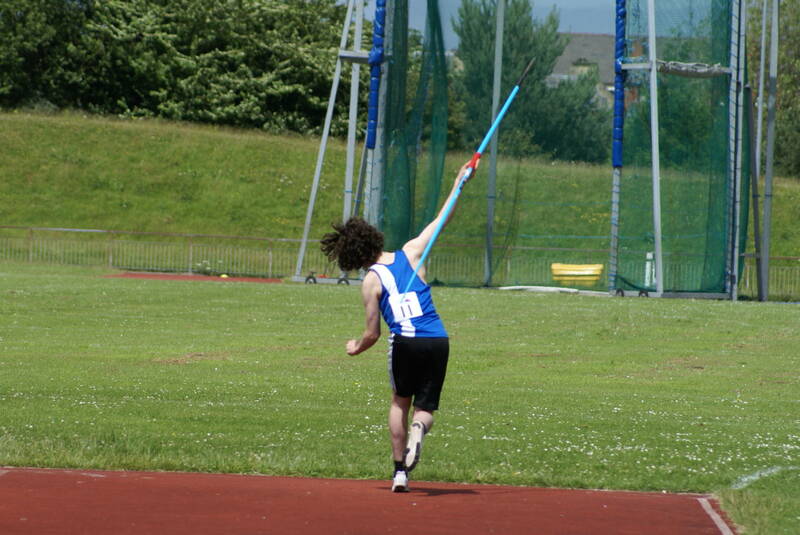 Rhys also set a Javelin PB with a throw of 18.33m. 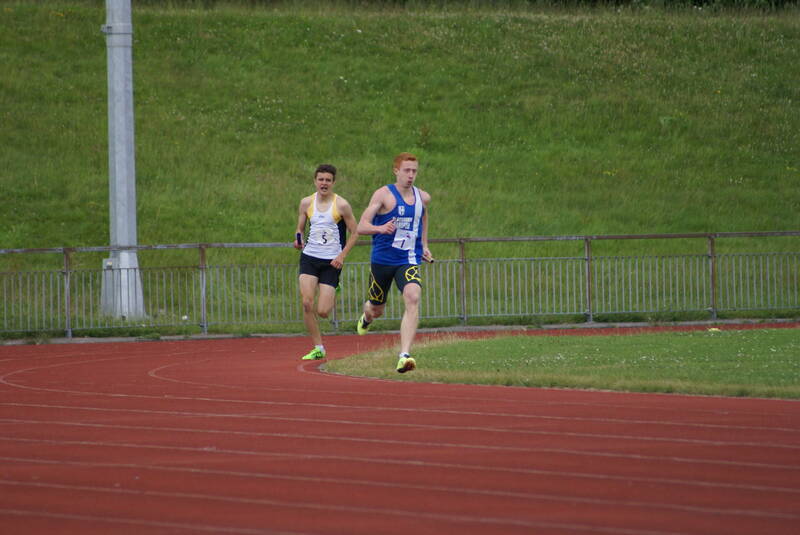 Leon Thomas set a big new PB in the 800m finishing 2nd in a cracking race against the Horwich athlete carving 7 seconds off his PB recording 2.37.0. 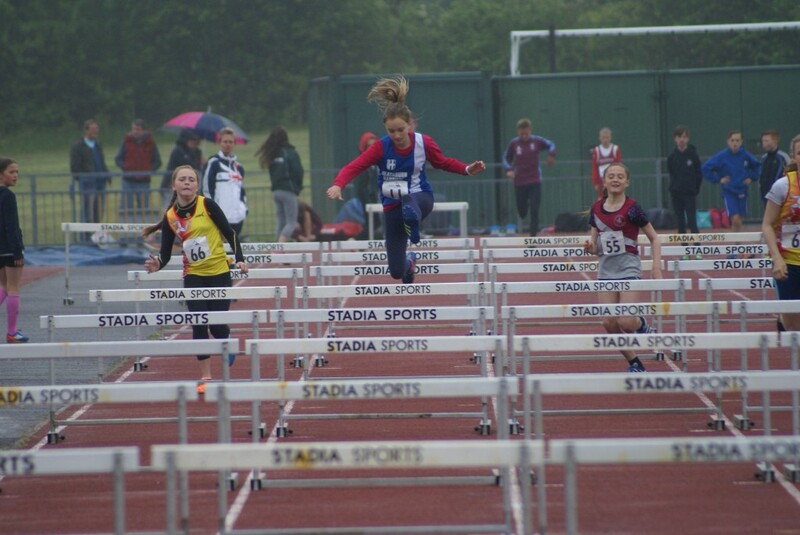 U13 Chloe Jameson set herself two new PB’s on the day, firstly in the Long Jump with a new PB of 3.04m and a 75m personal best of 12.7. 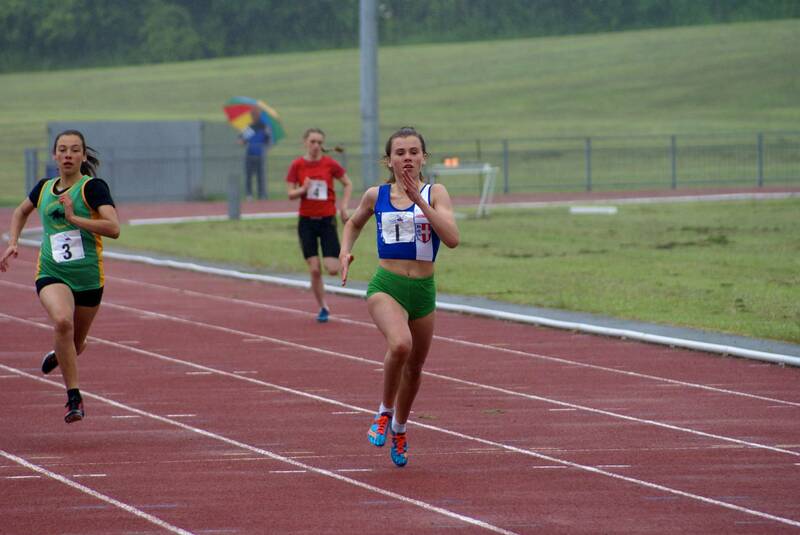 Chloe Bleeks just got in by a tenth of a second for a new PB of 2.45.4 in the 800m ‘B’ race and finished 3rd in the ‘B’ U15 100m in 14.7. U13 Luke Ingleson in his first outing over 1500m took a good 3rd place with 5.26.5. 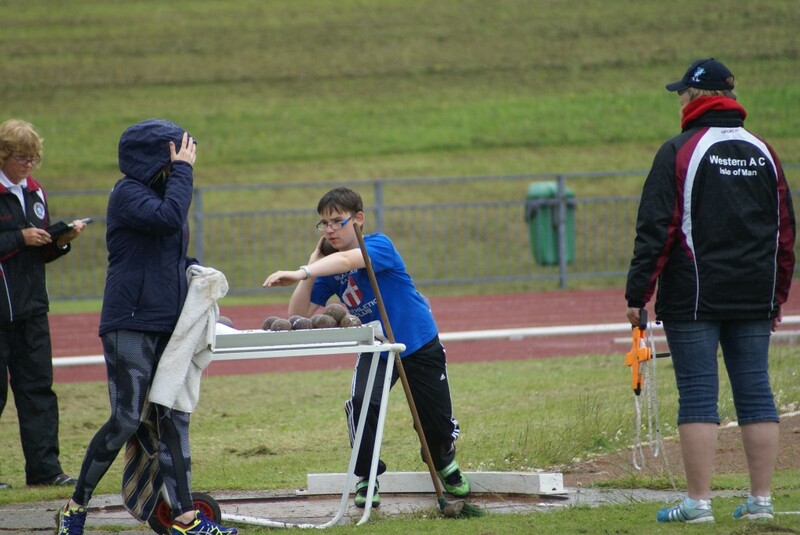 In the Throws Anthony Kent added over 4 metres to his Hammer current distance for a new PB of 33.79 when he won the U15 Hammer ‘A’ and then added another PB in the Shot Putt by a metre coming 2nd with a throw of 9.91m. 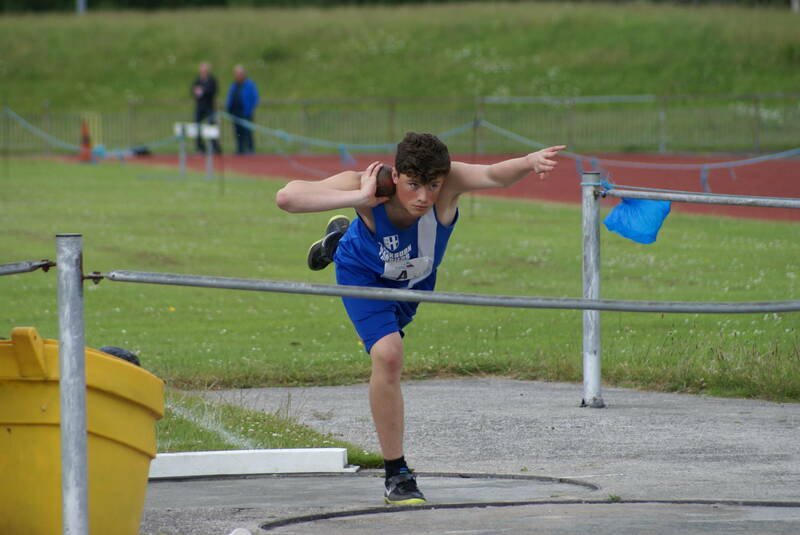 Lucas Davies joined Anthony in adding good points to the Team total finishing 2nd in the Shot Putt (7.32m) and 3rd in the Discus (17.83m). 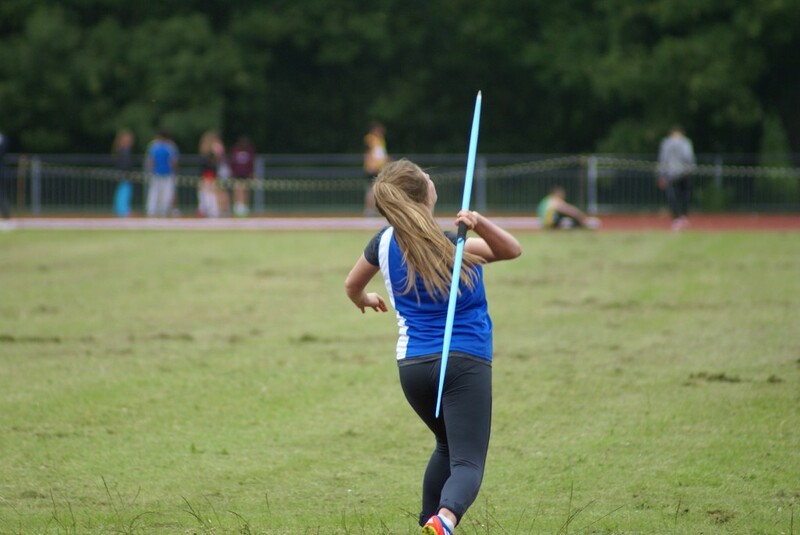 The Teams throwers had a really good day with new member Teigan Fawcett setting two new PB’s winning the ‘B’ Shot Putt (7.51m) and placing 2nd in the ‘A’ Javelin 24.51m which was a new PB by 6 metres. 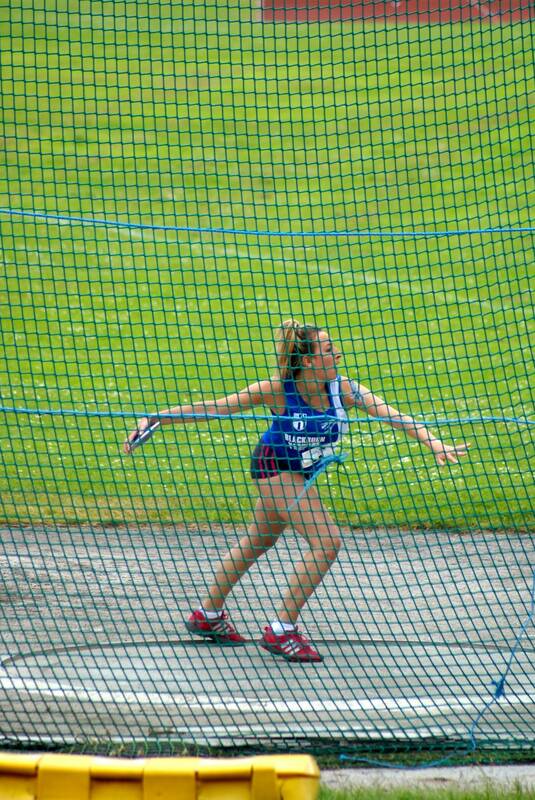 Charlotte Williams like our other throwers is in a rich vein of form winning the ‘A’ Hammer (34.92m) and the ‘B’ Discus (20.86m). 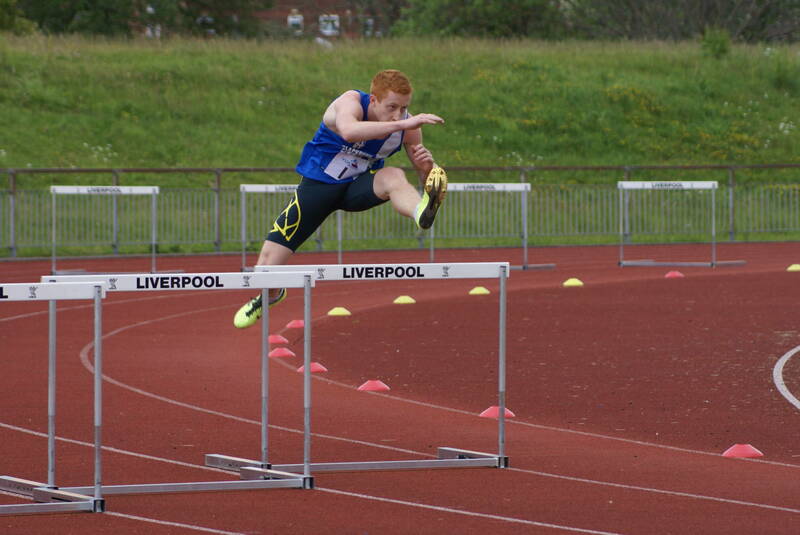 Nick Massey another athlete in really good form won the 100m (12.4) and 80m Hurdles (12.6). Josh van der Linde equaled his PB in winning the ‘B’ 80m Hurdles (14.0) and then improved his Pole Vault PB from 1.80m to 2.10m. 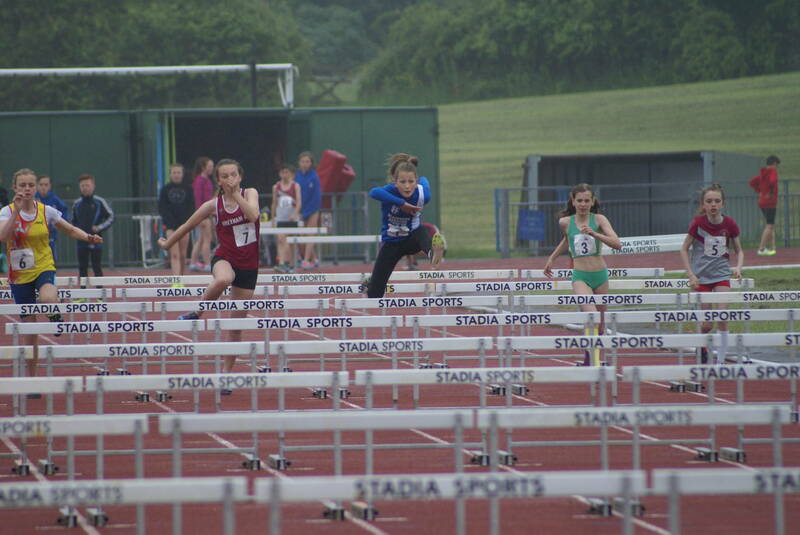 Emily Warren can’t stop winning taking the 75m Hurdles in 12.0 and the 200m in 27.4. 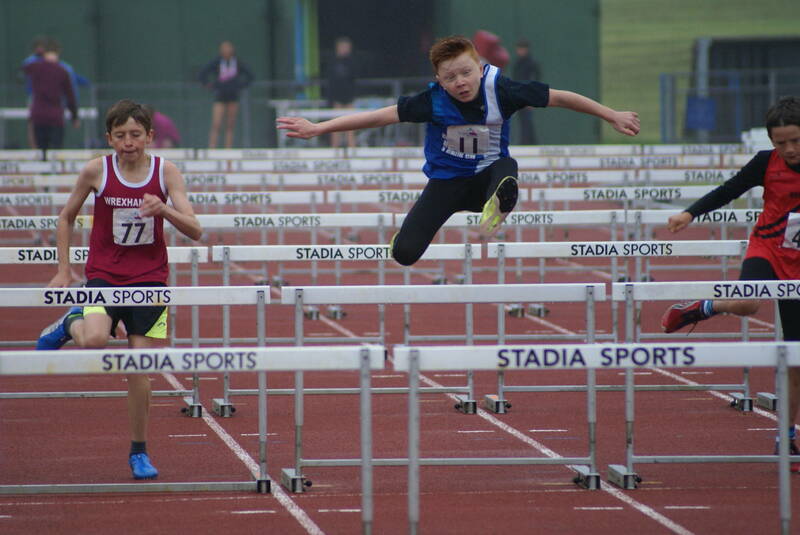 U13 Myah Booth won the 70m Hurdles in 13.1 – Sam Farnworth took 2nd place in the 75m Hurdles (14.8) – Luis Billington (U13) set a new PB in the 75m Hurdles with 16.3 and Anna Dabrowski came in 3rd in the 70m Hurdles (16.6). 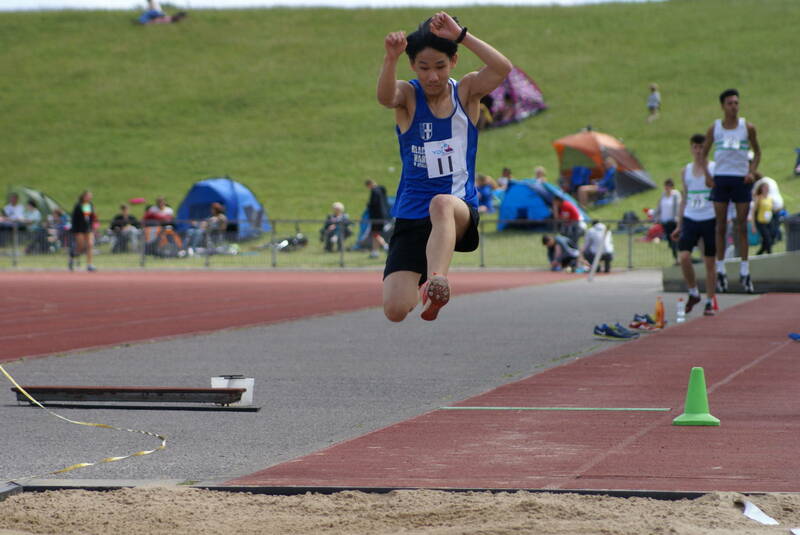 Jacqui Howard won the ‘B’ Long Jump with 4.32m and set a new PB in the High Jump (2nd) with 1.35m. 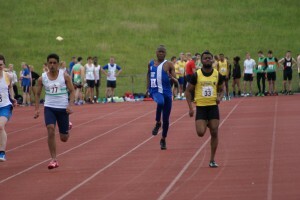 Ben Cecil set two new PB’s in the 200m with 26.6, down by half a second and the 300m (3rd) with 42.6 as well as jumping 4.09m to finish 2nd in the Long Jump. 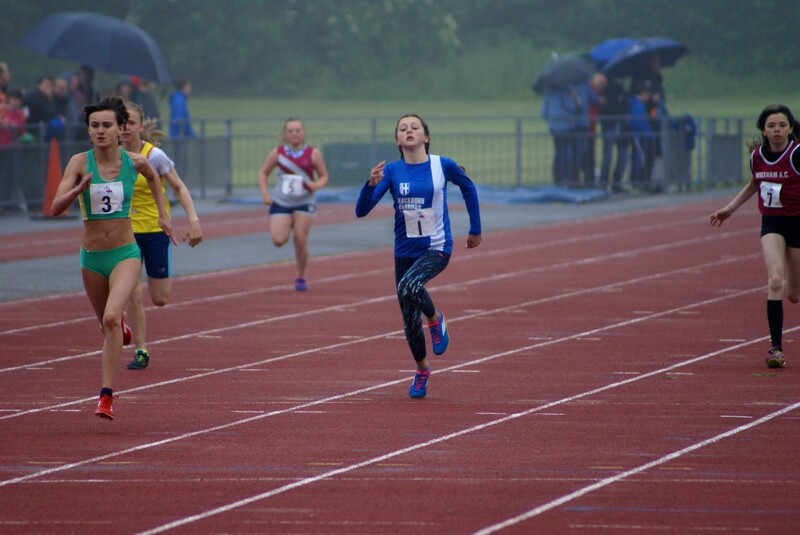 U13 Emily Raine returning after surgery on her wrist took a good 3rd place in the 75m with 10.9 and set a new PB in the 150m with 21.5 (4th). 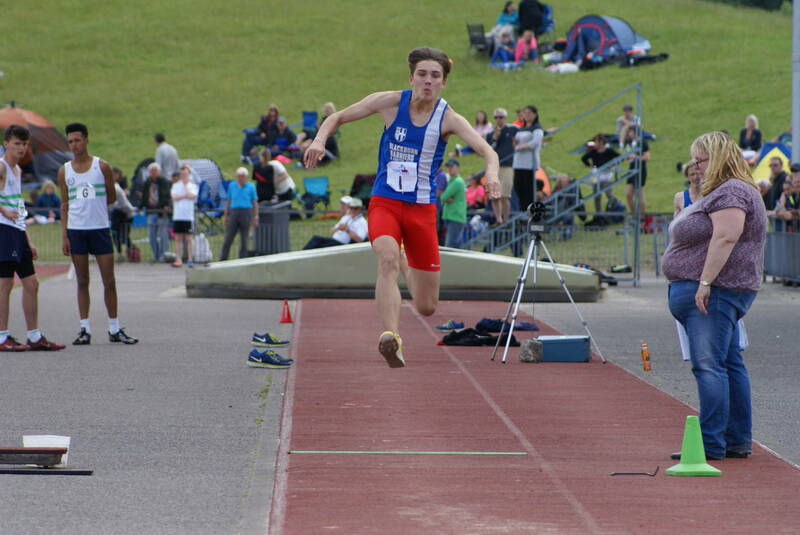 Another new PB came for Solomon Brown in the Long Jump when he cleared 4.19m which added 30cm to his previous best. 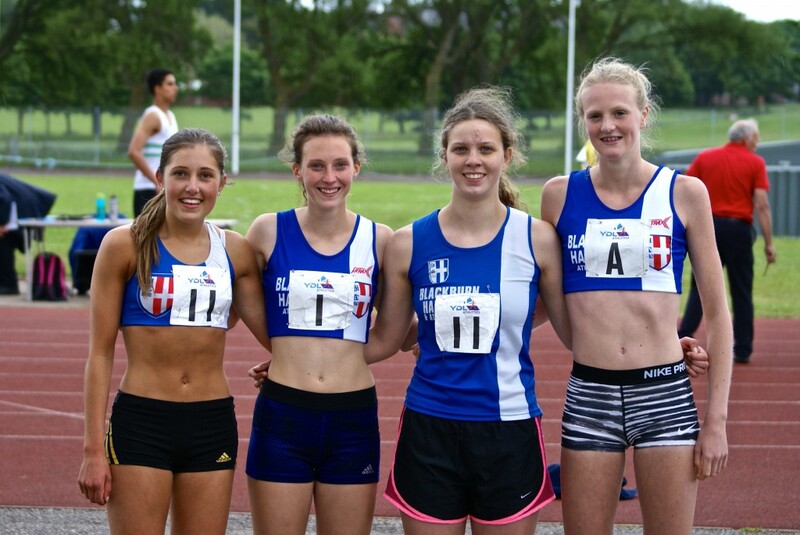 And last but not least a great performance in the Relays with a win for the U15 Girls 4 x 100 squad in 54.4 and with the Club record standing since 1986 at 53.6, the girls – Hannah Cookson, Chloe Bleeks, Jacqui Howard and Emily Warren are targeting this. 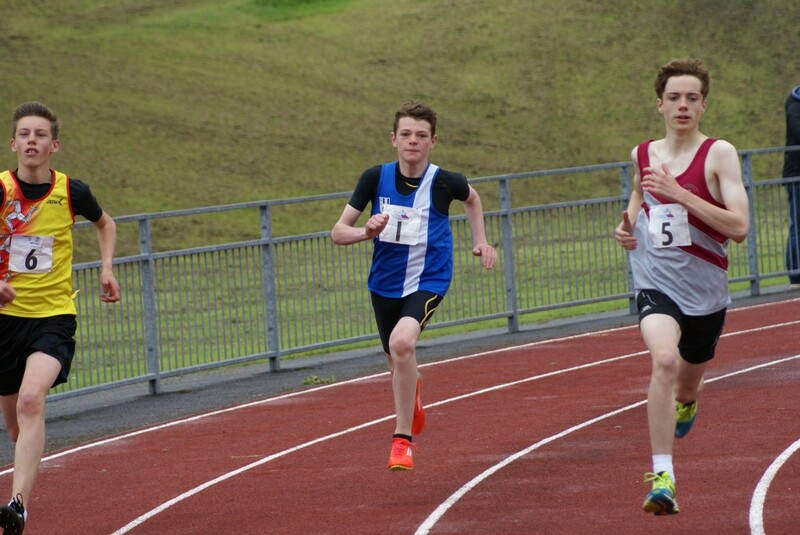 One of the highlights of the day saw Lucas Davies take over Leg 1 in the U15 Boys 4 x 100m Relay and hand over in the lead to the 2nd Leg runner. 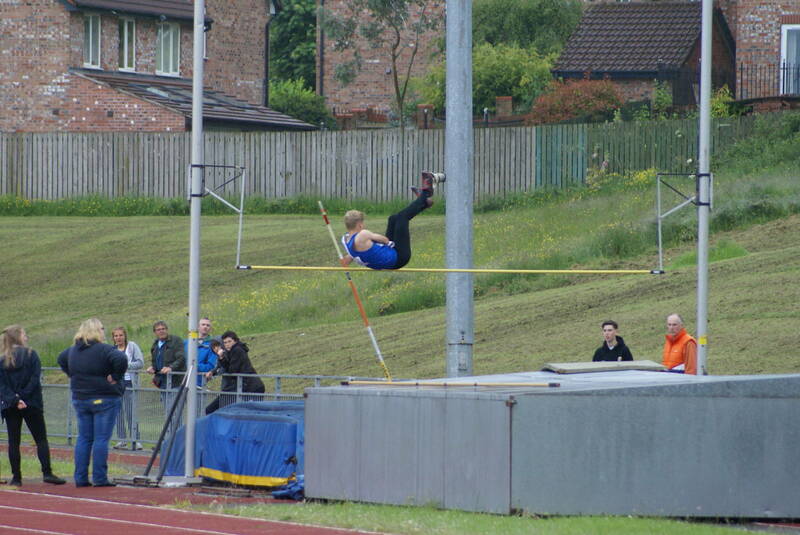 Where did that come from? 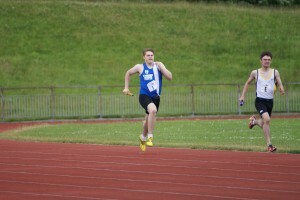 Rocket Davies.